SARAJEVO, BOSNIA and HERZEGOVINA: Capital and the largest city of Bosnia and Herzegovina, and it’s a city where I would love to go back again and again at every chance. I think I left a piece of my heart somewhere in the old town of Sarajevo. This is one of the most historically interesting cities in Europe. Sarajevo is famous for traditional religious diversity where Muslims, Catholics, Orthodox Christians, and Jews lived and coexisted for centuries. You will also find different ethnic groups like Bosniaks, Serbs, and Croats. The city is still recovering from the Yugoslav War from 1992 to 1995. The town is surrounded by Olympic Mountains in all directions with few different rivers running through the city. Miljacka is the river that runs very close to the old town. You can see homes and communities on small hills and slopes, makes it so beautiful during day or at night. Bosnia and Herzegovina overall is a scenic country with endless mountains, lakes, rivers, and small villages. 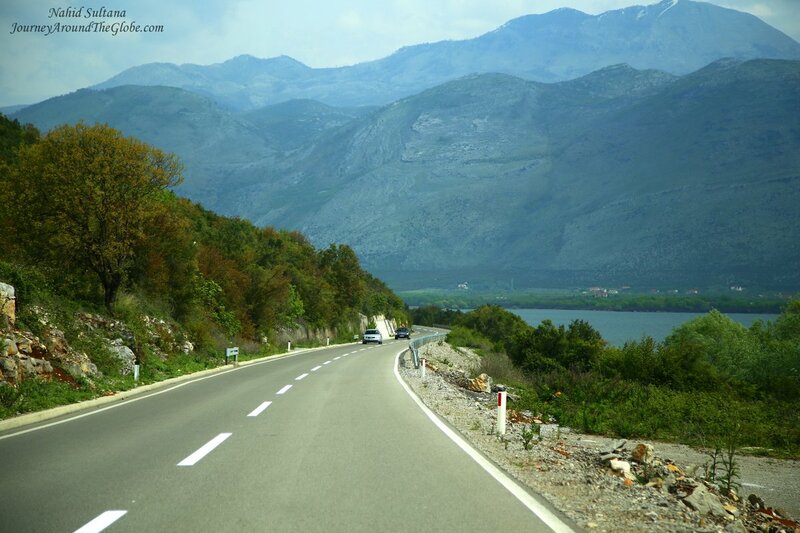 From the moment we crossed the border from Montenegro and until we reached Sarajevo, then drove to Mostar and then before reaching Dubrovnik, Croatia…the roads in this country are amazingly beautiful and thru wilderness and nature. I couldn’t stop looking out the window or dare to fall asleep, because I knew I would probably miss something extremely good. 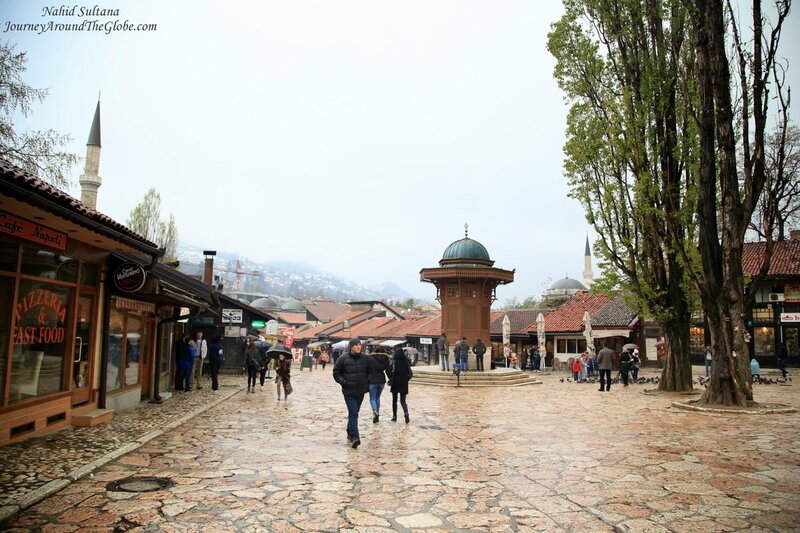 Although this area has been continuously inhabited since the Prehistoric period, Sarajevo became a city with the arrival of the Ottomans in 1462. Since then two great civilizations, Ottoman and Austro-Hungarian, settled here whose cultures and religious are faithfully kept even today. These two empires contributed to the diversity and unique beauty of the city. Bosniaks, Croats, Serbs, Roma and other ethnic groups live here side by side in harmony. 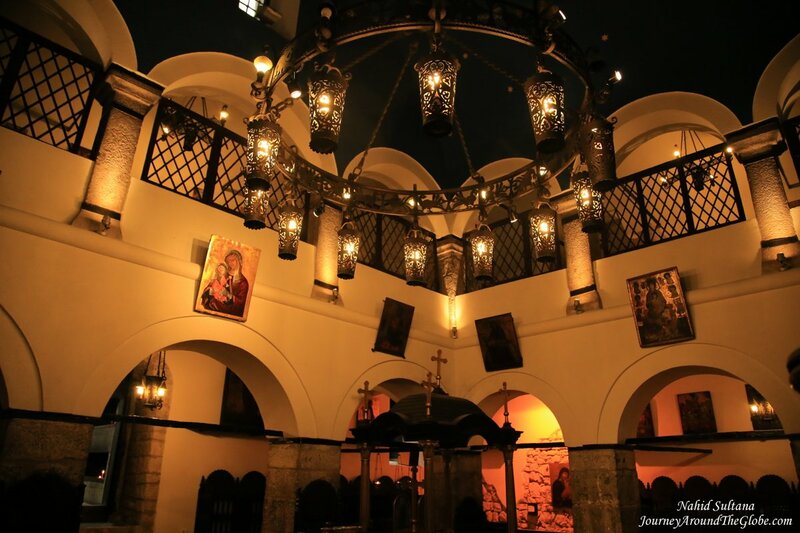 A member of any confession in Sarajevo will feel the pleasure of freedom and coexistence. The richness of the city is in its countless religious institutions, historical museums, and cultural monuments. May be that’s why Sarajevo is called the “European Jerusalem”. Most of the sites, if not all, in Sarajevo are financed and assisted with the help of the American people and USAID. All the tourist attractions are very well-marked with information boards written in English. Sarajevo is considered as one of the safest cities in Europe with lots of friendly people. Don’t hesitate to ask for help, the locals speak pretty good English. TIME of TRAVEL: After visiting Podgorica, Tirana, Skopje, and Pristina during our Easter break trip in 2014, our fifth destination was Sarajevo. It was a long 15 hours of drive from Pristina. The shortcut takes usually around 7 hours, but that’s thru the mountains and our hotel staffs told us not to take the mountainous road because it is very risky when snows. When we left Pristina, it was snowing in the city, but as we got towards the mountain, snow got thicker and heavier. Our small car started to skid and couldn’t move further. A police car told us next 50 km of the road would be very bad and we should turn around. So, we drove four hours for nothing and came back to Pristina. After lunch, we started driving towards Podgorica thru Albania and after 7 hours of exhausting but scenic drive, we spent the night in Podgorica. Next morning we started driving towards Sarajevo and took us about another 7 hours to reach our hotel there. The drive from Podgorica to Sarajevo is extremely beautiful with mountains, lakes, national parks, and villages. But I wouldn’t recommend anyone driving on this road at night, because of the road condition. They are narrow roads on the mountains with few deep trenches on the sides and zigzag paths. 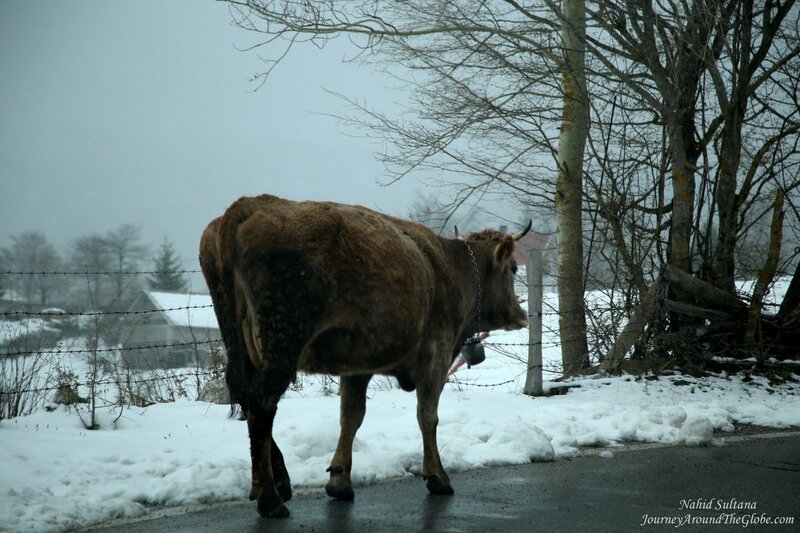 This drive can be very dangerous and fatal after dark unless you are a local. The so-called “highway” gets worse after you cross the border into Bosnia and Herzegovina. It’s beautiful but the windy narrow roads made me a bit sick. When we arrived in Sarajevo, it was wet and gloomy. Although we weren’t so lucky with the weather, we still managed to get the warm feelings of this city. There were snow on the small hills and far distant mountains. OUR HOTEL: We stayed in Hotel Herz in Sarajevo, on a small slopey hill. It was only 10 minutes’ walk from the old town. This was more like an apartment suite with a small kitchen, a fridge, and a microwave. The staffs were very friendly and casual. We had free breakfast, Wi-Fi, and parking. The best part of this hotel was that they had free drinks, like hot chocolate, coffee, teas, macchiato, and other hot drinks for their customers. EATING and SHOPPING: Our first dinner was near the Sebilj in old town, Cevabdzinica Kurto – a kebab and burger place. Bosnian burgers are supposed to be very tasty. But I wouldn’t recommend this place to anyone, the food was ok…nothing amazing. Next day lunch at Sedaf (also in old town near Srebrenica Exhibition) was a very good choice. We had Bosnian soup with chicken, carrots, and okra, fresh salad, beef stew with mashed potato, and a Bosnian sweet – “tolomba” for dessert. The food was fantastic and so was the price. Overall, food is very cheap in Sarajevo. Our last dinner in Sarajevo was at Inat Kuca, a traditional Bosnian kitchen few steps outside the old town and opposite of the town hall. This old Turkish building itself is a historic one with few stories of sitting arrangements for the customers to enjoy gourmet cooking in a cozy environment. We had Bosnian beef pasta and chicken with rice. 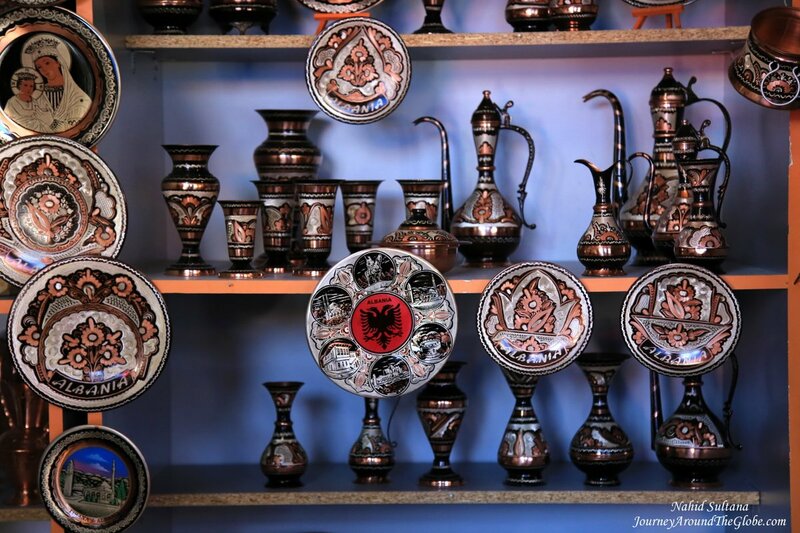 For souvenirs, copper ware, such as coffee sets, sherbet holders, pitchers, and covered dishes…can be purchased in many places throughout the old town of Sarajevo. Aladdin slippers, Bosnian carpets and bags, are some of the memorabilia you can bring back from Sarajevo. 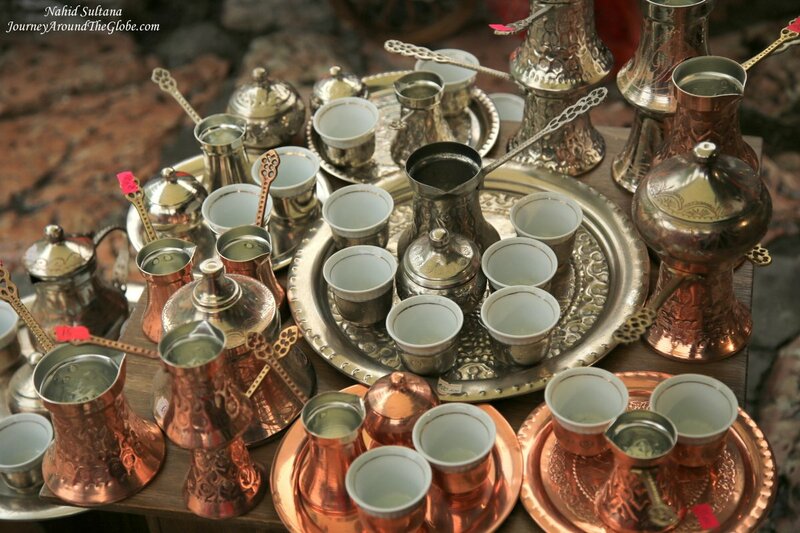 Most of these items look very similar to Turkish handcrafts, it’s because this place was ruled by the Ottomans for few centuries and there are lots of ethnic Turkish-Bosniaks in the surrounding villages who make these items in the traditional styles. 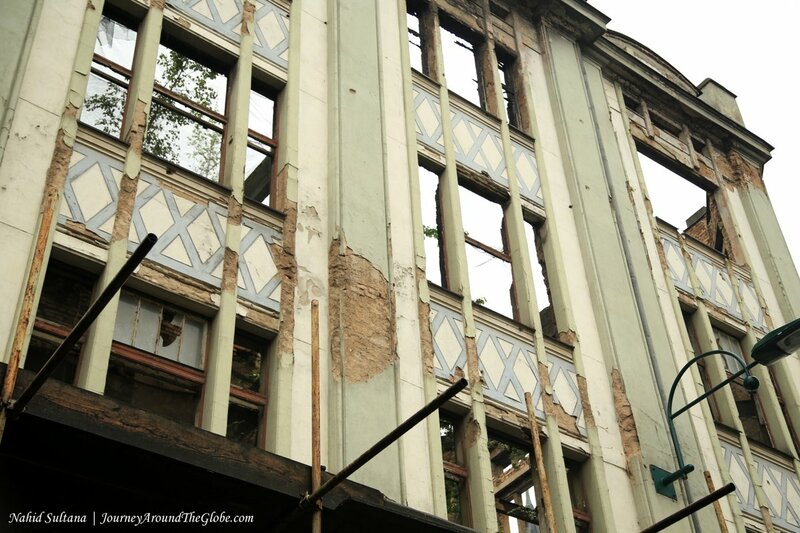 PLACES WE’VE VISITED: We had a whole day in Sarajevo to see, which was really not enough time for a city like this. On top of that it was drizzling almost all day when we were out. This is a city adorned with beautiful landscapes, captivating history, and so many interesting spots to discover. You can see old buildings with bullet holes from the war are standing next to newly constructed stylish buildings. Sarajevo also houses the tallest building in the Balkans, Avaz Tower, little bit outside the city center. All of the main sites of Sarajevo are located in or around old town within walking distance. We explored Sarajevo on our own, but there are lots of guided walking tour to fit every interests and time. A free tour is also available which lasts hour and half and starts at 4:30 everyday. Day trip includes going to Bosnian Pyramids, Dubrovnik, Srebrenica, Tunnel Museum, Mostar, and other cities. Tunnel of Hope is a museum little bit out of the main city center near the airport, about less than half an hour drive, where we couldn’t manage to go but wanted to. It was built under the runway of Sarajevo Airport in 1993. It was city’s only connection with the outside world during the four years of siege. A portion of this wartime tunnel was turned into a museum for tourists. There are some original footage from the war along with everyday items from those misfortune years. This is a place that we shouldn’t have missed. 1) OLD TOWN: After arriving in Sarajevo an early evening, we checked in at our hotel and headed towards the Old Town of Sarajevo to find some traditional kitchen for dinner. This is not a typical European old town, it has a nice eastern twist with some Oriental and Middle-Eastern touches. If you are lucky, you may also hear Islamic call to prayer few times a day. 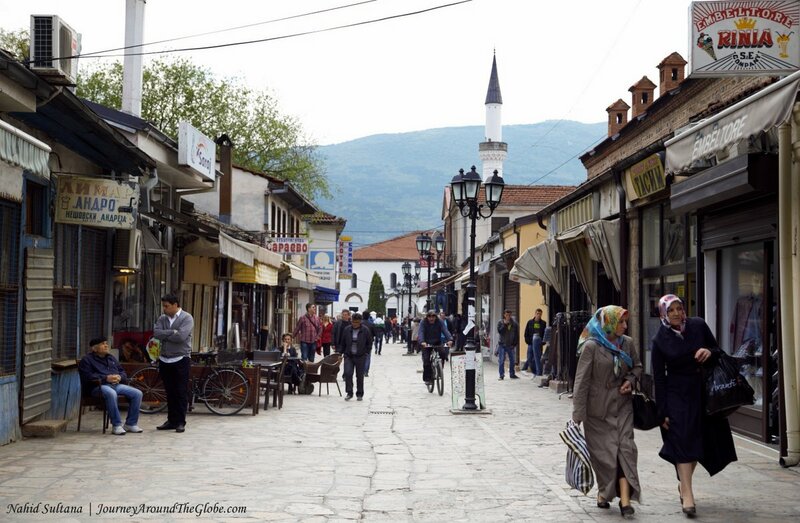 Few centuries ago, when this part of Sarajevo was in its prime, Old Town had around 4000 shops. Even now, the place kept it medieval charms and touches everywhere. Navigating thru those small side alleys is the best way to experience it. Most of the stores here sell Turkish style Bosnian goodies, mainly made by the local Turks. This is also a great place to go for some coffee. Bascarsija is the heart of Old Sarajevo. 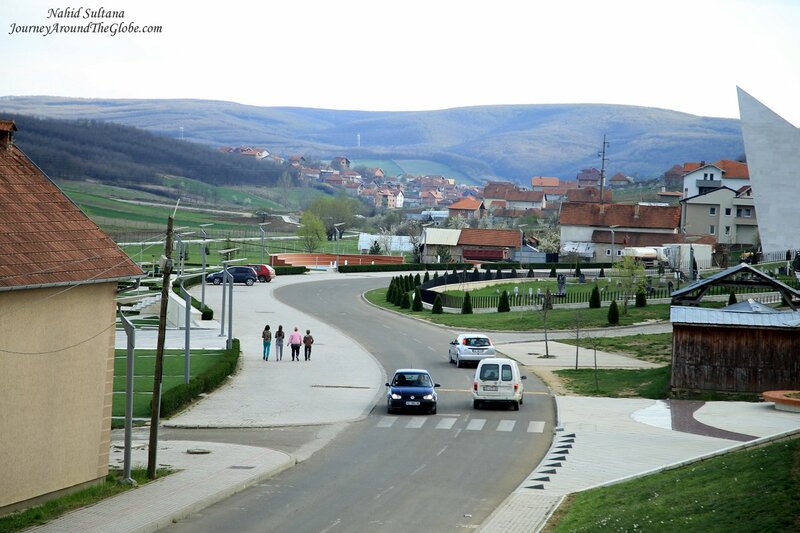 Its foundations were laid in 1462 and by the 16th century, Bascarsija had reached its height. 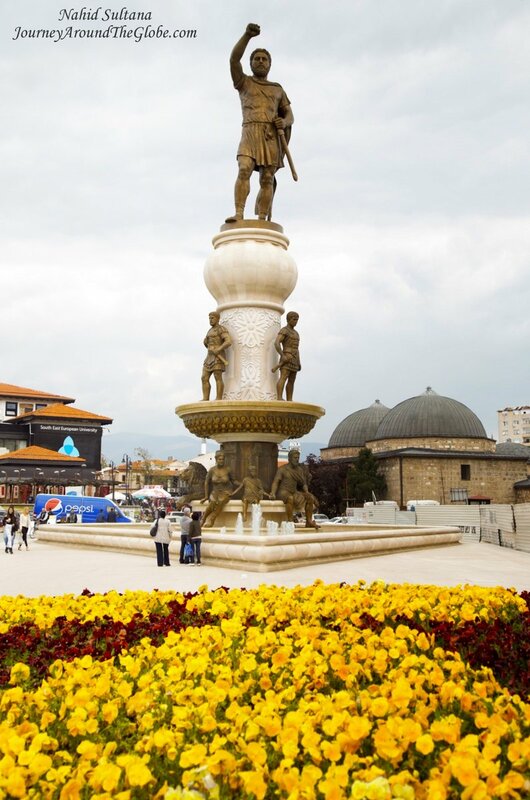 In the center of it is Sebilj (a kiosk-like public fountain), which is city’s one of the most recognizable symbol. Today, only a portion of the once great bazaar remains, but walking along its cobblestone streets gives a glimpse into their Ottoman past. You may still see some buildings from the war time here. 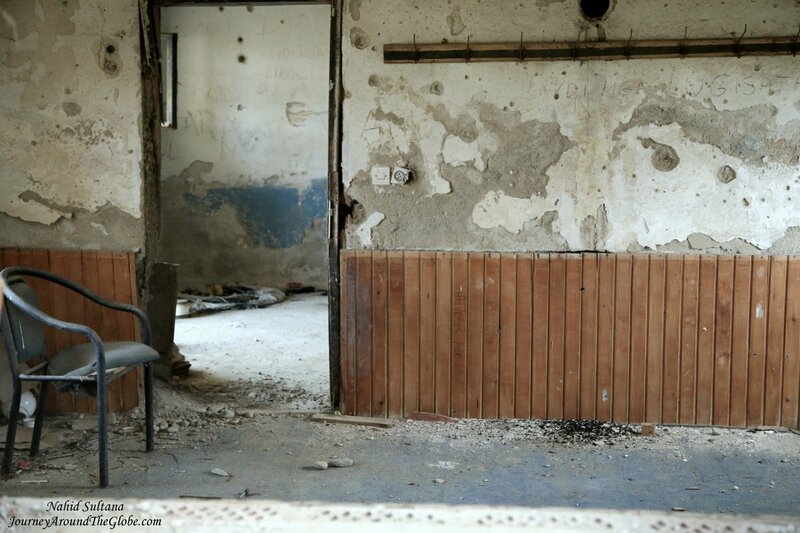 The bullet holes and broken windows are eyewitnesses of what Sarajevo went thru during that tragic period. 2) CITY HALL or VIJECNICA: We saw the City Hall of Sarajevo before entering the old town by the River Miljacka. This building serves as the most recognizable symbol of construction done in Sarajevo during the Austro-Hungarian period and the most beautiful example of pseudo-Moorish building. Erected in 1896, it consumed by flame in 1992. Now it is fully reconstructed and shines with its original glory. 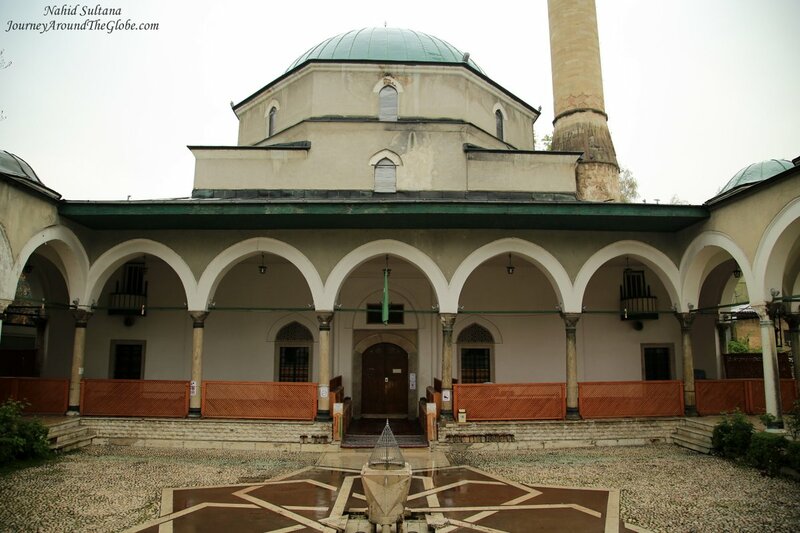 3) EMPEROR’S MOSQUE: This was our first destination on the 2nd day in Sarajevo. 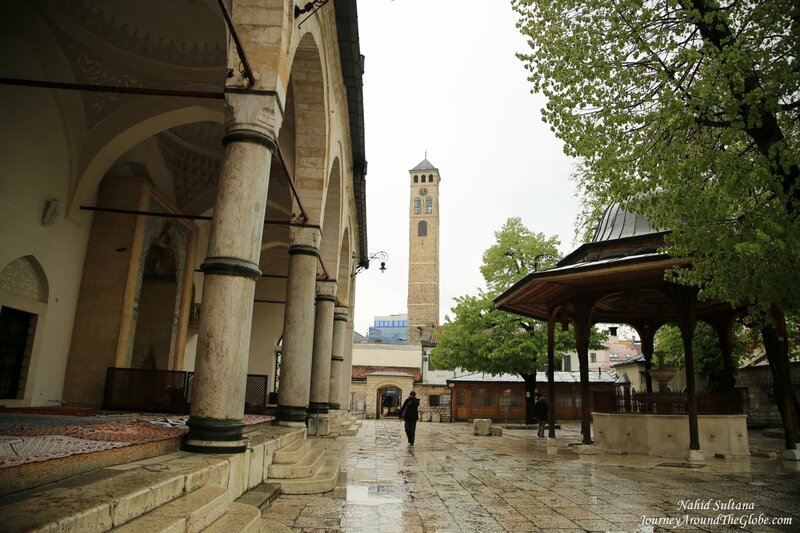 Also known as Sultan Fatihova Mosque, this is one of the oldest mosques in Sarajevo. An older mosque at the same place built by Isa-bey in honor of Sultan Mehmed II (the Conqueror) was destroyed by Hungarian army in 1480. A new, more monumental mosque was built at the same spot in 1565. The oldest part of the mosque, the central section, dates from that same year. The mosque was closed in the morning but we were told that it would open after the noon prayer. We only could peek thru its gate and saw the Ottoman style big courtyard with a fountain, dome, and tall minaret. 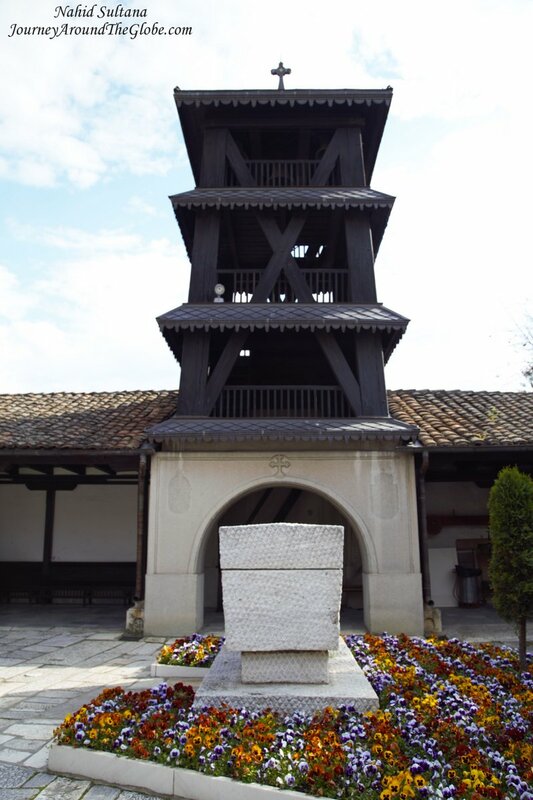 The burial ground beside the Emperor’s Mosque contains the graves of viziers, muftis, sheikhs, employees in the Emperor’s mosque, and other dignitaries of Sarajevo. The mosque is located opposite of the Town Hall inside a smaller street. There is no fee to enter and it opens at 1pm. 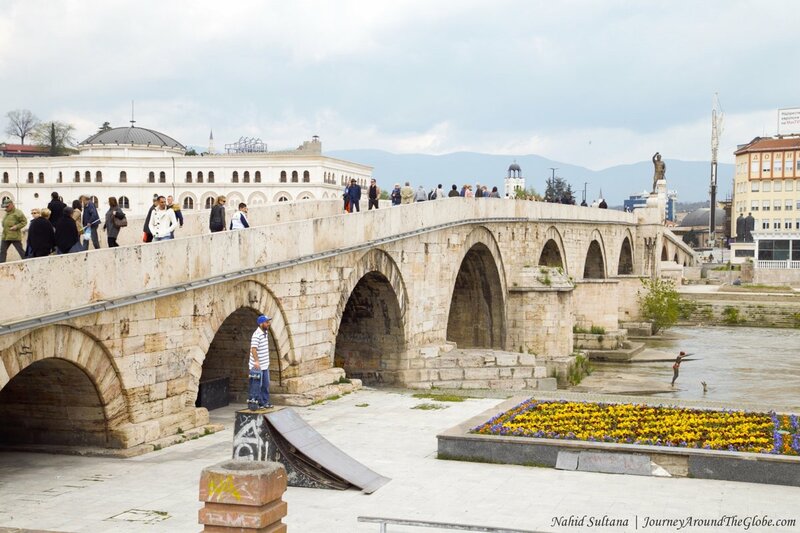 4) LATIN BRIDGE or LATINSKI MOST: Few steps further from the mosque towards the old town is Latin Bridge. In 6th century, following the Emperor’s and Skenderija bridges, the third wooden bridge was built over River Miljacka, on the site of the present-day Latin bridge. The residential quarter on the right bank of the river was where Sarajevo’s Catholics lived. The earliest record of this bridge is from 1541. But later the wooden bridge was replaced by a stone bridge which was swept away by floods several times. The bridge as seen today, with five arches was built in 1798. This is a historic bridge and has a close connection with the WWI. It was near the Latin Bridge on the right bank of River Miljacka, in 1914, Austro-Hungarian heir to the throne Franc Ferdinand and his wife Sofia were assassinated by Gavrilo Princip. Some historians consider this unfortunate event to trigger the outbreak of World War I. 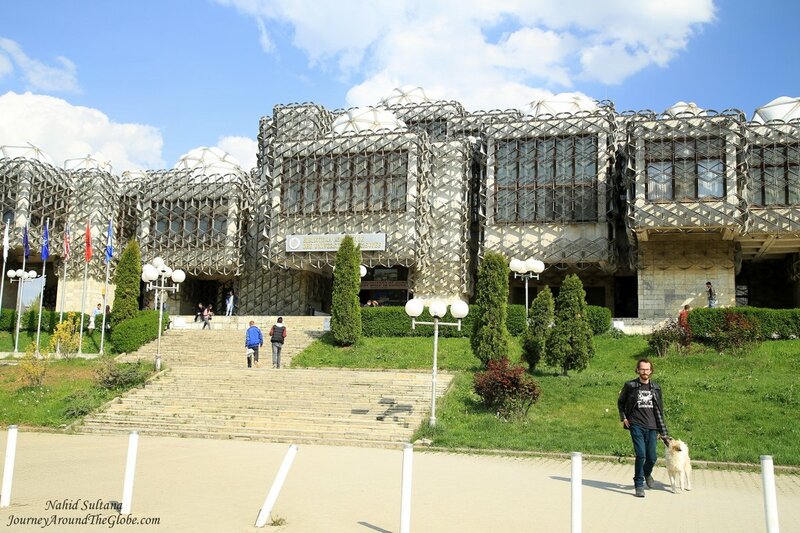 5) MUSEUM of SARAJEVO: One side of Latin Bridge is this museum. Museum of Sarajevo 1878 – 1918 deals with the history of Sarajevo and Bosnia and Herzegovina during the Austro-Hungarian period. 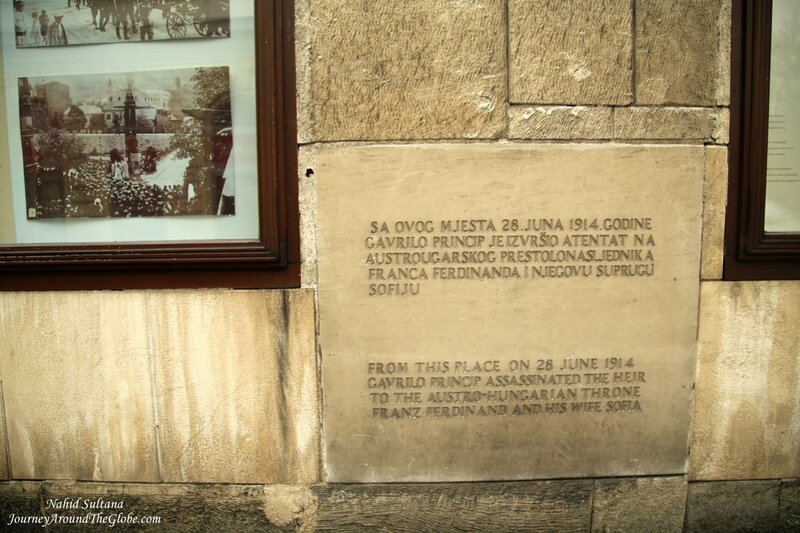 Some displays in this museum tell the story of the Sarajevo Assassination – murder of Austro-Hungarian heir to the throne Franc Ferdinand and his wife Sofia. Make sure to watch a small reenactment of a footage on how Prince Franc Ferdinand and his wife Sofia were murdered. Visitors can see historic documents, old pictures, arms, and uniforms from that period. The museum is very small and has only one floor. Ticket is 3 MK per adult and is located on one side of Latin Bridge adjacent to the point where Austro-Hungarian heir to the throne Prince Franc Ferdinand and his wife Sofia were assassinated in 1914. 6) BEY’S MOSQUE and CLOCK TOWER: This is a grand Ottoman style mosque in the old town. The mosque has a pleasant courtyard with a fountain for ablution in the middle. Women have separate door to enter but it was closed, so I couldn’t really see inside the mosque. But it is an active place of worship. Muslims or non-Muslim visitors are allowed but not during prayer times. It’s free to enter and look around, just have to dress appropriately and take your shoes off before going inside. There is also a Madrasah (Quranic school) opposite of the mosque, not sure if it still works though. 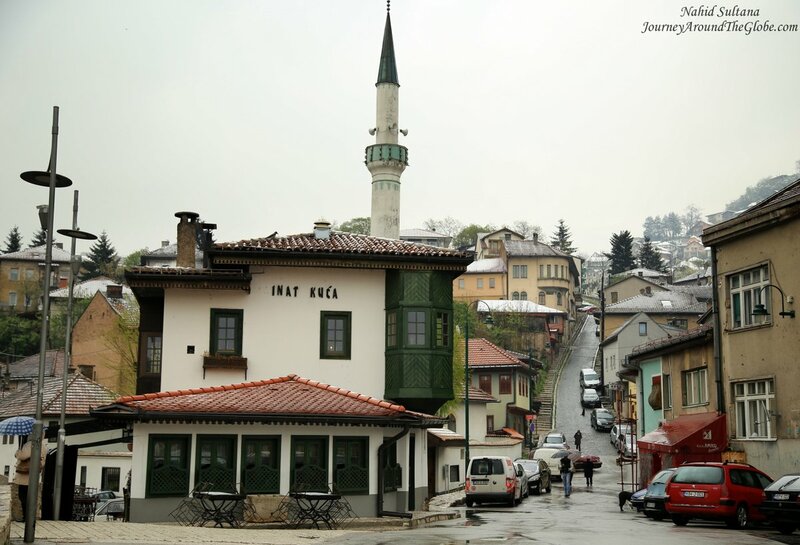 7) MORICA HAN (SARAY): This is the only preserved Ottoman Inn in Sarajevo. This used to be a hotel/inn in the 18th century. Now, there is a big restaurant, a Turkish carpet shop on the first floor along with some old hotel rooms, and a big courtyard with lush trees in the middle. We took the old wooden stairs to go upstairs. This is where guests used to stay overnight during their journeys couple centuries ago. Presently, there are some offices which we couldn’t access. 8) OLD SERBIAN ORTHODOX CHURCH: It started to drizzle when we started walking little bit out of the old town and towards this church. 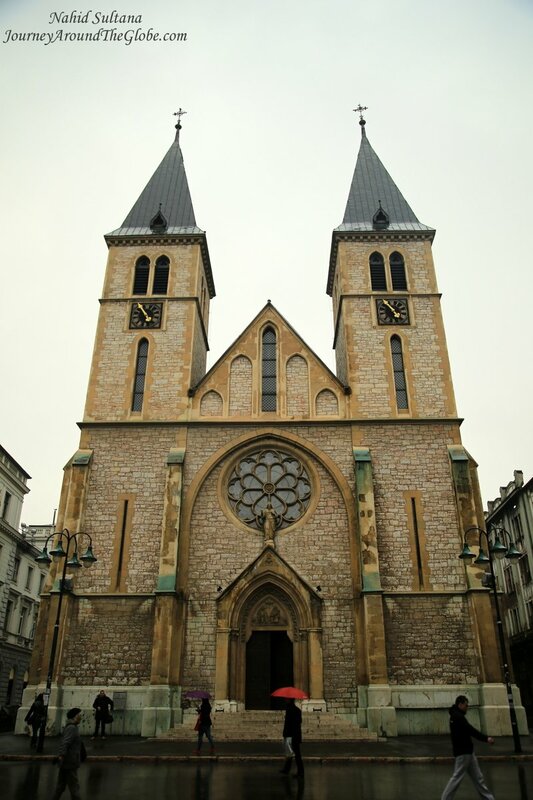 It’s also known as Serbian Orthodox Church of the Holy Archangel and is one of the most important Cultural and Historical monuments in Sarajevo and Bosnia and Herzegovina. It has been safe guarding holy icons and religious relics for centuries. This is a tiny and elegant church in the old quarter. Some say it’s from the 5th or 6th century while others say from 12 or 14th century and yet some only talks about its rebuilding during the Ottoman period in the late 15th or 16th century. But its present look is from 1730. Its archaic foundations and inner architectural constructions with two-storied arcades are from early Christian times (5th or 6th century). It has a nave surrounded on three sides by a colonnade which makes it a unique example of well-preserved church architecture in this part of the world. The most important and valuable feature of the interior of this church is the carved wooden iconostasis. It is a great beauty from 1674. The church bears interesting drawings, different outlooks, medieval folklore, and shows a rare beauty of colors. Although we didn’t go there and wasn’t even aware of it at that time church museum is one of the oldest museums in Bosnia and Herzegovina. It was free to enter but taking photos is not allowed. Opening hours are from 8am to 6pm everyday. 9) CATHEDRAL of JESUS’ SACRED HEART: This cathedral is located in the old part too right beside Srebrenica Exhibition, which was our next stop. This is relatively a recent cathedral from 1889 with dominating neo-Gothic elements. Pope Pius XI donated the great bell of this cathedral. Although the cathedral was closed when we were there, the building looked grand from the outside. 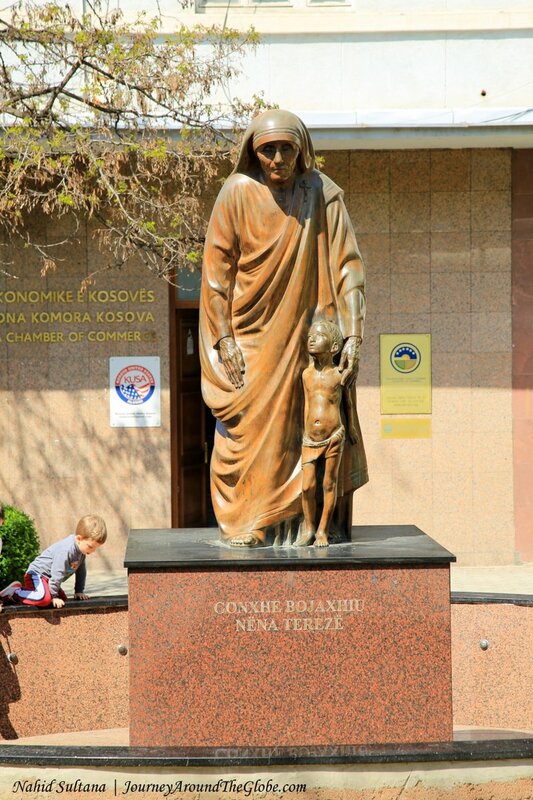 10) SREBRENICA EXHIBITION: This museum is located right beside Cathedral of Jesus’ Sacred Heart. This is a must-see place in Sarajevo. Visiting this museum is a learning experience as well as an awakening for all. The world should know what happened in Bosnia in 1995 and how innocent lives were taken by the Serbian army in the process of “Ethnic Cleansing”. Srebrenica is a small town in Bosnia, about 5 hours drive from Sarajevo, where this massacre took place in 1995. This was the most cruel and heartless genocide in European soil after WWII. 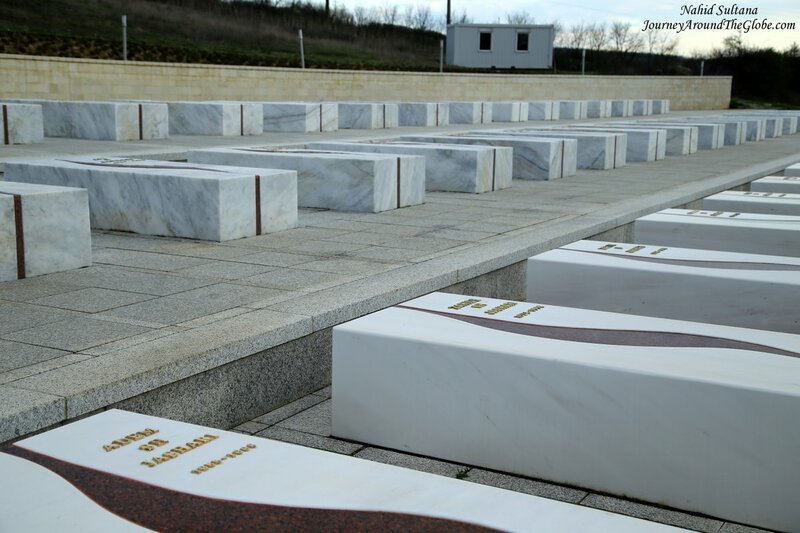 Approximately 8000 Bosniaks, mainly boys and men, were killed by the Serbian army and few hundred Russian volunteers after UN announced Srebrenica a “safe area”. Total 11,000 people were killed in Bosnia and Herzegovina in Bosnia War from 1992 to 1995. 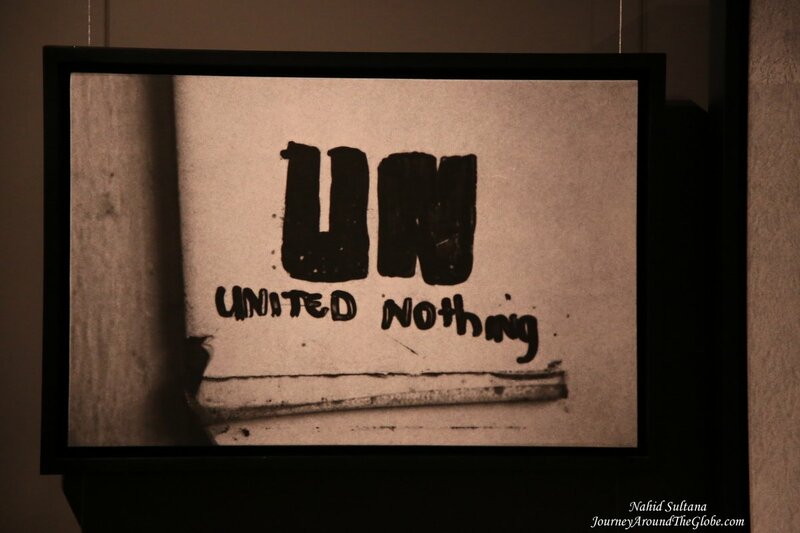 This is the first memorial gallery in Bosnia and Herzegovina – exhibition space aiming to preserve the memory on Srebrenica tragedy and 8372 persons who tragically lost their lives during the genocide. Memorial Gallery 11/07/95 is the highlight of this exhibition. Watch the documentary on the war and its after-math. The museum is open daily from 10 to 6pm except Mondays. Entrance is 10MK per adult. 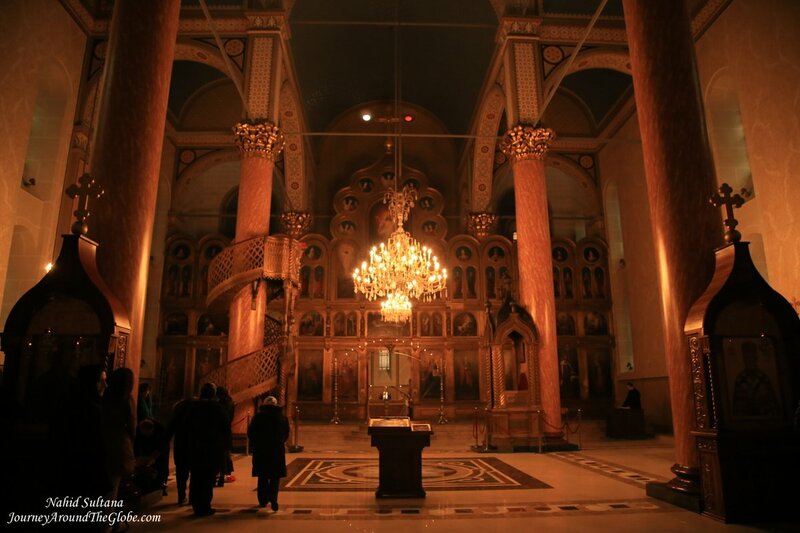 11) ORTHODOX CHURCH: Serbian Orthodox Cathedral of the Holy Mother of God was erected in 1872 in neo-Classical style and is one of the largest orthodox churches in the Balkans. The interior features elaborate ornamentation of the altar, ceiling, walls, and floors. There wasn’t any entrance free and hours are 8am to 5pm everyday. 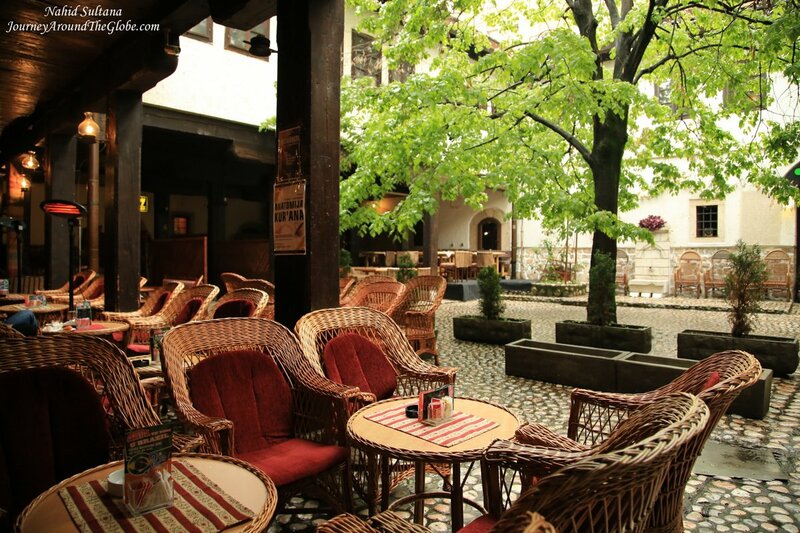 12) TASLIHAN: Taslihan was built in 1543 in the period of the greatest expansion of Sarajevo. After its construction, Taslihan was the largest and the most representative facility of its kind in the region. It was built of stone and covered with vaults and domes made of lead, which was not the case in other inns. Unlike other inns, accommodation was free in this inn. It could hold up to 90 guests. Taslihan was on fire several time, the last time in 1879 it was completely destroyed. In 1912, last remnants were removed from the site. The original purpose of caravanserais and hans was to provide accommodation for merchants and their wares and horses. In 1878, there were fifty caravanserais and hans in Sarajevo, of which the most important were Kolobara, the Taslihan, and Morica han. Unlike other hans, Taslihan contained a row of shops, making it a trading han. The courtyard also contained a sebilj (public fountain) with a mosque. Taslihan is just in ruins right now. We didn’t even know about this place until we were walking by it and saw the ruins and information board. The authority was still working on the excavation when we saw it. 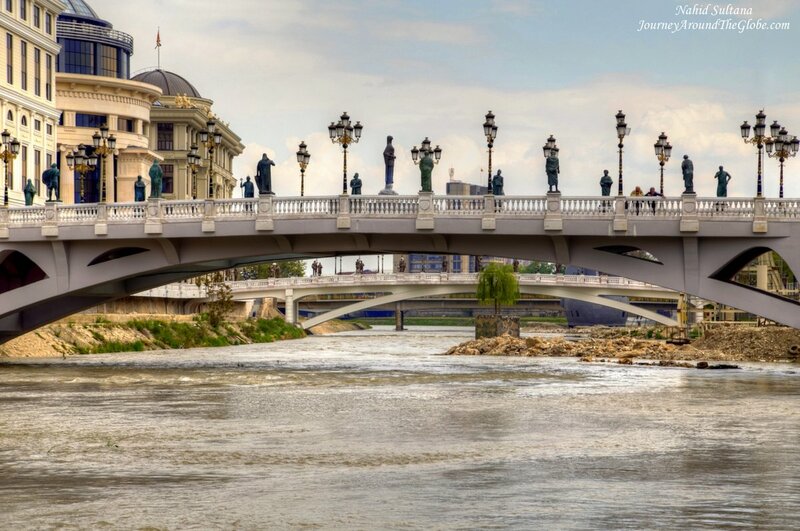 SKOPJE, MACEDONIA: Situated by River Vardar, Skopje is the capital, the largest, and the most diverse city of Macedonia. It gave birth to some of the greatest people of the history, like Mother Teresa and Alexander “The Great”. Historically, the earliest traces of life in Skopje Valley are from the early Stone Age around 5000 to 3000 BC. From then on, Macedonia came under many rulers, empires, and kingdoms since its foundation, from the Byzantines, Romans, Ottomans, Serbians, then became a republic of Yugoslav Federation. However the Ottomans left the most and greatest marks on Skopje than any other rulers. Ottomans ruled Macedonia for many decades until the 20th century and built a large numbers of mosques, Turkish baths, and other architectures. 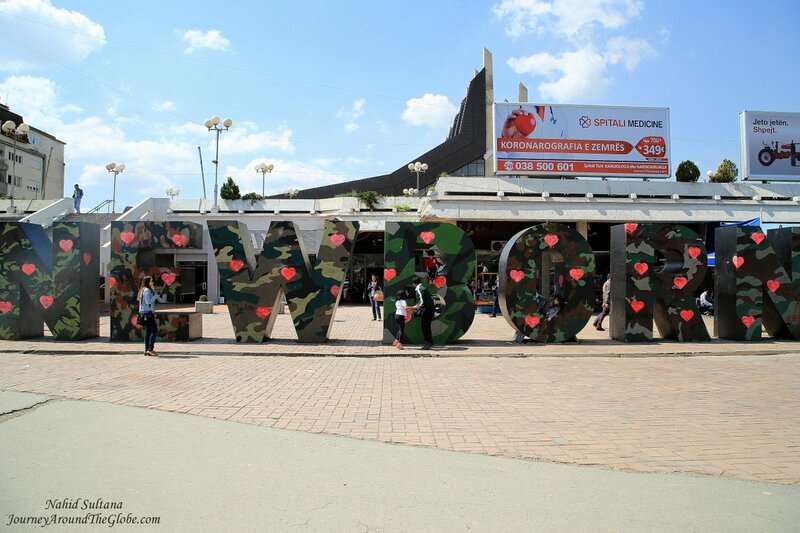 Even now, Ottoman’s legacy is extremely visible in all over Skopje. Overall, there are 40 mosques in Skopje and more than 100 mosques in Macedonia. This is a city where you can see a harmonic and peaceful combination of Christianity and Islamic culture side by side. Unfortunately, a major earthquake in 1963 destroyed about 75% of the city in just few seconds. Many of Skopje’s historic and important buildings were leveled to ground that day. But the city did great job pulling itself back to its original look with more modern and futuristic style. River Vardar runs thru the city and can be seen from the city center. The capital is surrounded by mountains in all directions and you can see them in the far distance. Skopje is a clean and tourist friendly city. It’s very well-marked and organized with information boards and signs near all the sites…small or big. Walking is the best way to get around but taxi is much cheaper than other parts of Europe if you need them for further distance. 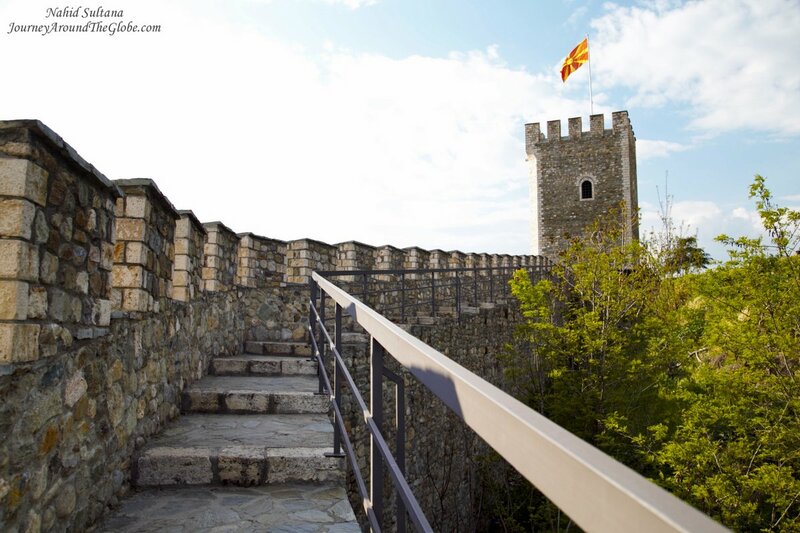 TIME of TRAVEL: Skopje was one of the destinations we covered during our Easter Break Trip of 2014. After visiting Podgorica in Montenegro and Tirana in Albania, we drove more than 4 and ½ hours to reach Skopje. I know it may sound like a long one, but when you are driving thru hills, snow-capped mountains, blue lakes, small villages, and pretty valleys the few hours in the car is nothing. We entered in Kosovo for a short time too before entering Macedonia. Just an FYI, if you have a rental car and don’t have insurance to drive in Kosovo (most rental companies’ insurance doesn’t cover damages occurred in Kosovo), drivers have to buy car insurance for 15 euros at the border. From Skopje, our next stop was Pristina, Kosovo. OUR HOTEL: The hotel we stayed in Skopje, Hotel Victoria, was a family run place with luxurious rooms and excellent customer service. The owner himself gave us some ins and outs of the city and recommended us a nearby traditional Macedonian restaurant “Macedonian House” on the first night and to Matka Canyon and lake for the day we checked out to go to Pristina, Kosovo. The hotel had free breakfast buffet, Wi-Fi, and parking. It’s located in a quiet residential neighborhood, about 15 minutes of walk from the city center. We really got a homely service from the owner, his wife, and their daughter here, and our kids got some special treats before leaving the hotel. EATING and SHOPPING: “Shkembe” is somewhat popular here since I’ve seen it in the menu of few restaurants. This soup is made with cow intestine (may be lamb too, not sure)…didn’t dare to try it. Other than that fried cheese or Greek salad are also common in many restaurants. We had our first dinner in “Macedonian House”, a place which was recommended by our hotel owner. This is a top class place to try some traditional dishes. 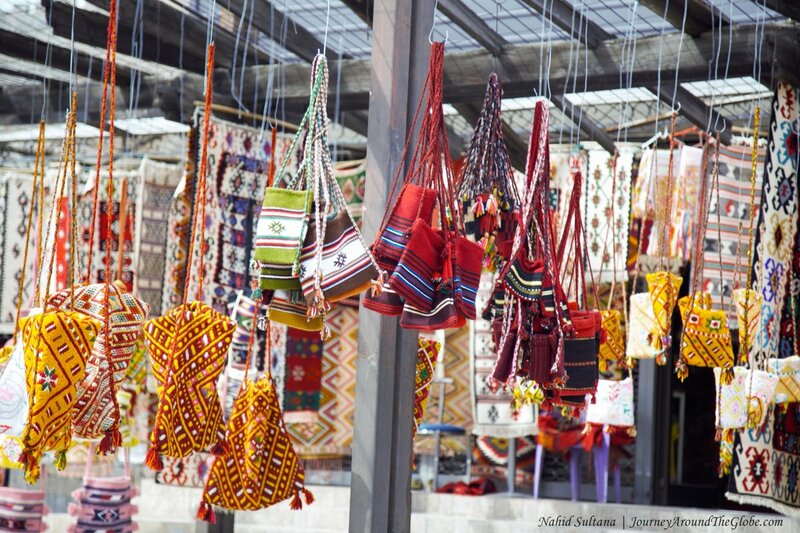 It is a big place decorated with traditional and handcrafted items from the locals. We had breaded cheese, chicken casserole, rolled chicken with cheese, eggplant with feta, fried zucchini, and onion soup. The price was way less than our expectation and the service was fantastic. There was also some live piano at the end. Next day lunch was in the old town opposite of Daut Pasha Double Hammam. This was a small street-side place with good food. We had some hot dogs, Greek salad, and breads. Again, price of the food here is a lot cheaper than Western Europe. Next day we had lunch in Canyon Matka Hotel and Restaurant when we went to see Matka Canyon and Lake. This is a pleasant place for meal by the lake. It’s a bit pricey but the food was great. There were more options near the entrance of this canyon. 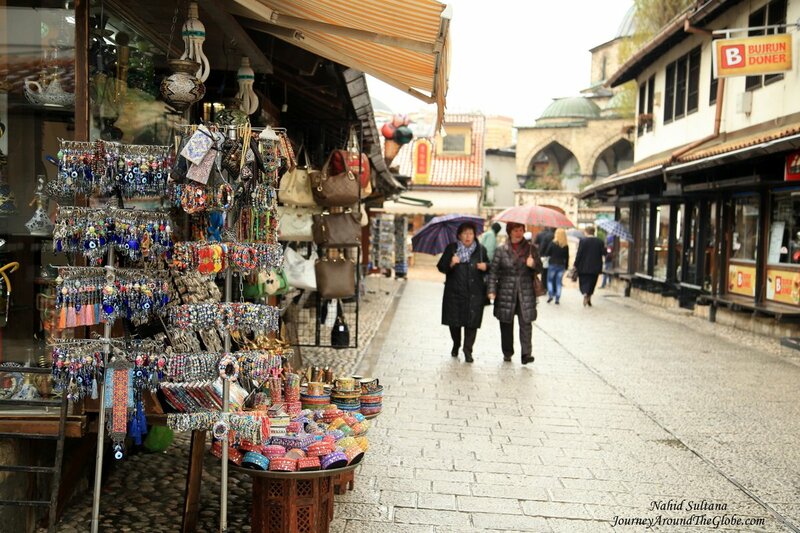 Old Bazaar of Skopje is a very good place for those souvenir hunters. Many Turkish stores sell traditional and handmade goods. You can find carpets, Macedonian dolls, home decors, and almost everything else in this market. PLACES WE’VE VISITED: Skopje is a city where you can do and see countless things and you won’t get bored for a single moment for a long time. We had only a day in the city of Skopje and about half a day in Matka Canyon which is less than an hour drive from city center. We only saw the highlights of this capital in a day. Some of the places we didn’t visit but sounded interesting are Holocaust Memorial Center, Macedonian Revolutionary Struggle, some old Turkish inns – like Kapan Inn and Suli Inn, Daut Pasha Hammam, and tons of museums all around the city. 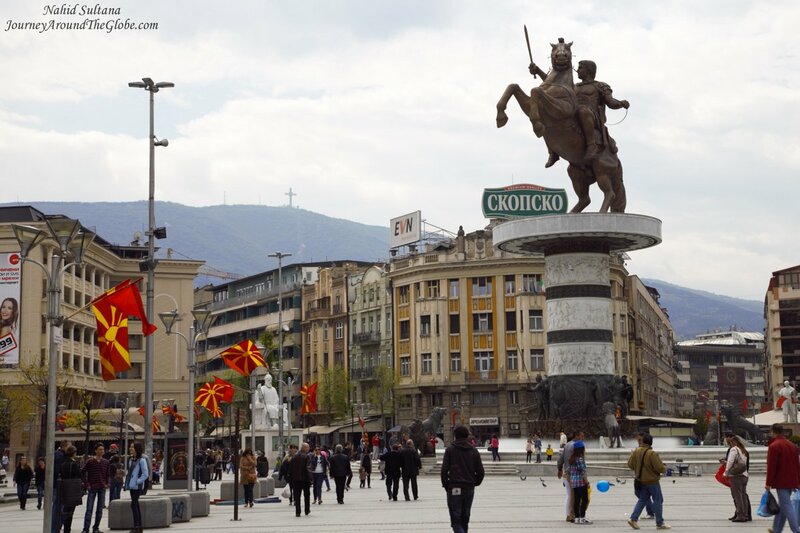 Most of the main attractions of Skopje are close to Macedonia Square and are within walking distance. 1) MACEDONIA SQUARE: This is the main and the liveliest square of Skopje. I just loved its big space and energetic atmosphere. There are countless interesting statues and sculptures all over this square, mostly of Macedonian revolutionary figures. But the grandest sculpture is the one in the middle with the prettiest fountain of this city. This is the statue of Macedonia’s bravest son, Alexander the Great on his horse-back (though some say it depicts a Macedonian warrior on horse). This 26 meter statue was built not too long ago in 2011 to commemorate 20 years of independence of Macedonia. At the base of the sculpture are 8 bronze soldiers and 8 bronze lions. The fountain plays classical music with the water show every now and then, not sure of the time interval. Stone Bridge and Porta Macedonia can be seen from this point. Lots of grand buildings surround the square. There are many cafes, hotels, restaurants, and bars here. The place really comes to live in the evening. This is a just a fantastic place to hang out in the heart of the city. 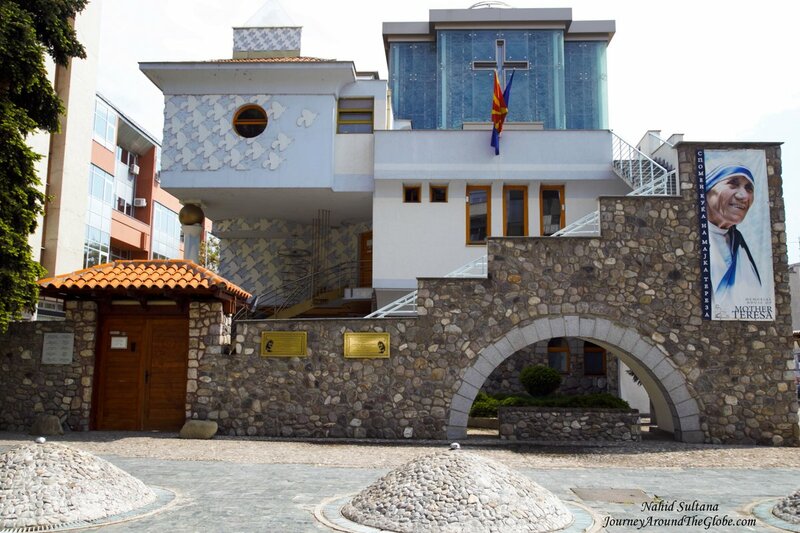 2) MOTHER TERESA BIRTHPLACE and MEMORIAL: Mother Teresa is the most renowned woman of Skopje who was born here very close to the city center in 1910. After spending 18 years in this house, in 1928, she left her native town and went to India, where she dedicated her life to the missionary work, selflessly caring for the sick and the poor. This Memorial Home was built in her honor, on the occasion of her 100th birthday. The memorial represents a modern and transformed version of the house where she was born. It was erected on the spot where a Catholic Church used to be. The new building is a tranquil place that depicts her entire life and represents a temple of spirituality, humanity and charity, as well as an eternal memory of her noble mission. Part of Mother Teresa’s remains was transferred to her sanctuary, consisted of many rooms: music room, private room, prayer room for Mother Teresa, multimedia room for chamber music and souvenir shop. We didn’t go inside the memorial or the museum. Museum is little bit further, this particular building is just a memorial. Feudal Tower is a 17th century tower from the Turkish era behind Mother Teresa Memorial which once served as a defense tower. 3) MACEDONIAN PARLIAMENT: We walked a bit from the memorial to come here. Macedonian Parliament is a pretty nice rustic orange building. 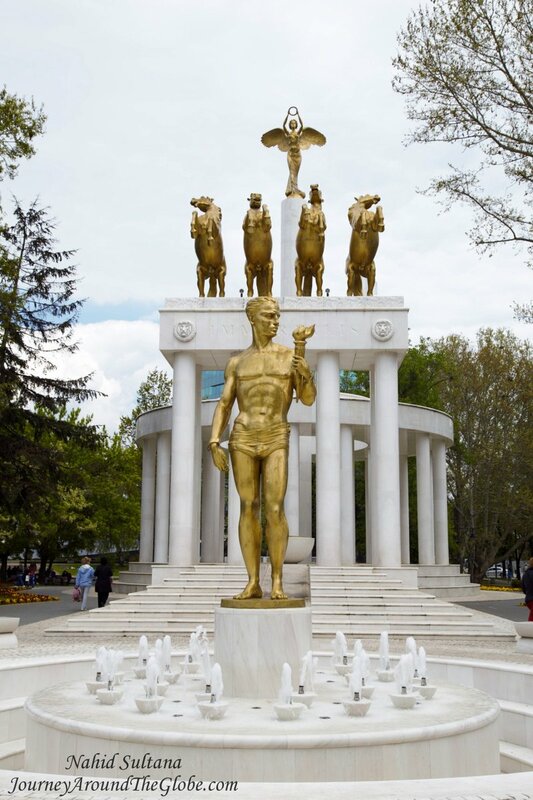 In front of this modernistic style parliament stands a statue of Nikola Karev on the back of his horse – a Macedonian revolutionary and socialist who perished in the war with the Turks. Opposite of the parliament, on the other side of the street is like a big memorial park – a complex of many statues. The biggest one there, facing the parliament is known as “Monument to the Fallen Heroes of Macedonia”. 4) PORTA MACEDONIA: After visiting the parliament and the big park in front of it, we entered the city center again thru the grand Porta Macedonia. 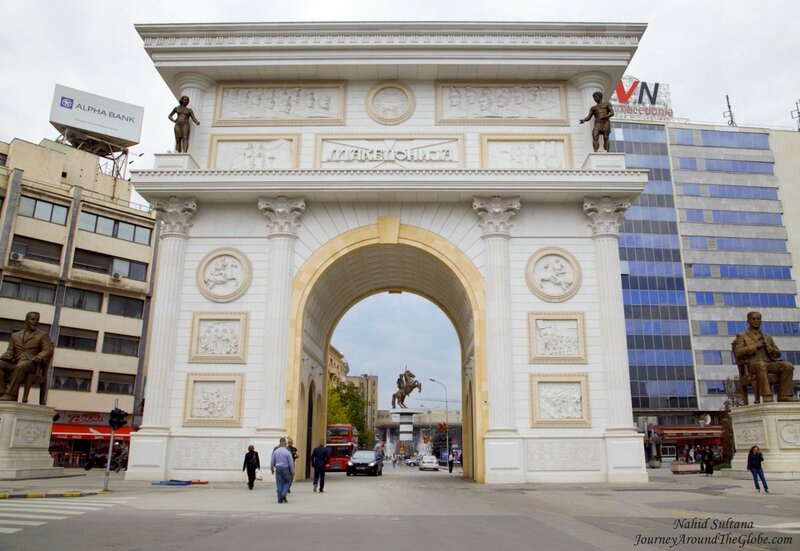 This is a white triumphal arch gate in between the parliament and Macedonian Square. The gate is dedicated to the 20 years of independence of Macedonia. Not sure of the statues of two gentlemen sitting on the two sides of the gate…may be two Macedonian heroes. 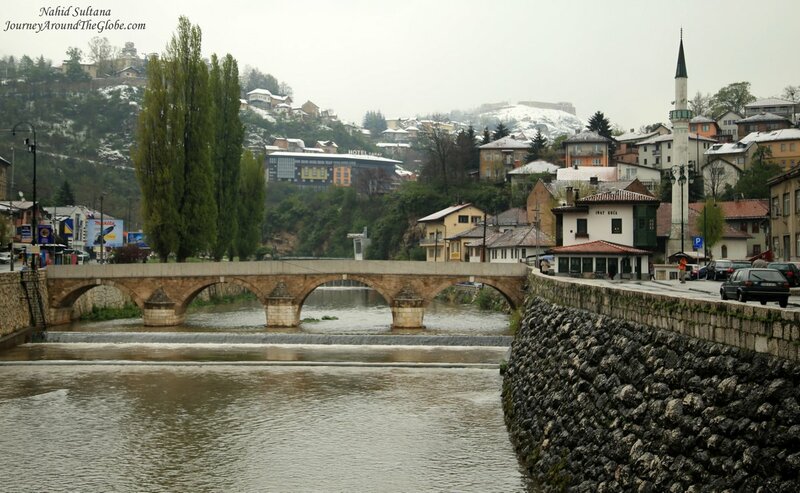 5) STONE BRIDGE and RIVER VARDAR: Another beauty of Skopje is their old Stone Bridge on River Vardar that connects old bazaar and main square. The original bridge is from the 6th century, from the Byzantine’s period; different reconstructions and renovations took place in the later centuries. The Watch Tower shaping like a Mihrab was reconstructed in 2008. You can see the original 6th century stone block and 13 arches of this bridge from the sides. Many important and historic buildings stand by the river bank. River Vardar cuts thru the city here and creates a pleasant place to hang out at any time of the day. There are tons of interesting statues on the both sides of the bridge and near the water. 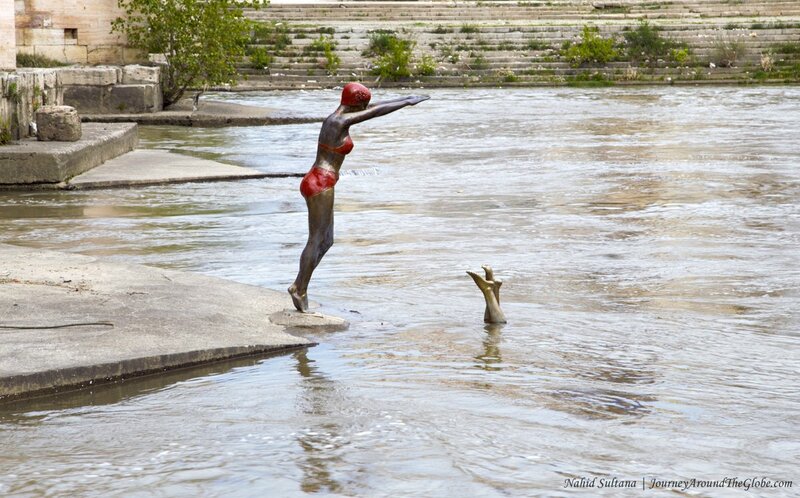 Look for the statue of a lady posing to dive into the water. 6) OLD BAZAAR: This is an old bazaar in the heart of Skopje and when I say old, it’s from the 12th century. But the bazaar had its greatest rise in the period between the 15th and the 19th centuries. This significant town site, where the narrow paved streets form a labyrinth, possesses a distinct oriental look. The stores, although situated between somewhat civilized frames, still nurture the traditional form of organization. They are attached to one another and most of them share identical minimalist dimensions. Apart from the numerous jewelry stores, taverns, tearooms, pastry shops, and other types of stores, in the Skopje Old Bazaar you can see the most important monuments of the sacral Islamic and profane architecture. 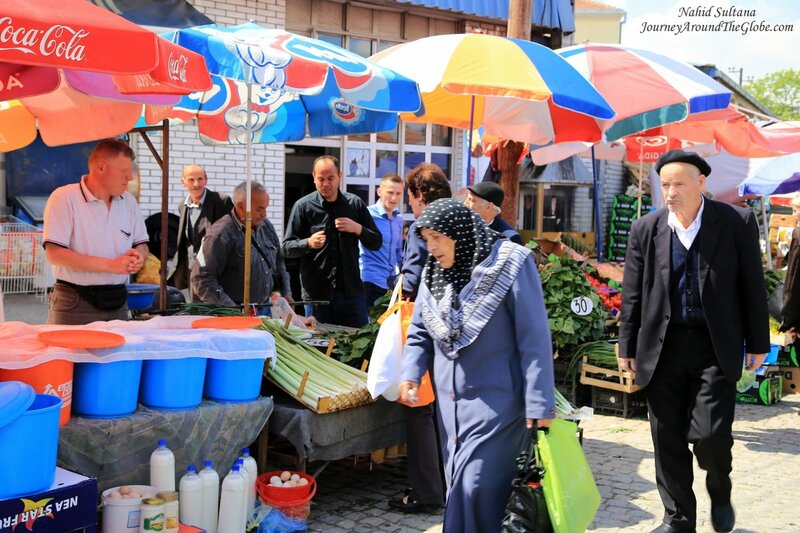 You can find a big community of Muslims in or around this bazaar. This is a good place to buy Turkish or Macedonian trinkets. It is quite big in size with countless small alleys. There are plenty of traditional cafes, restaurants, and bakeries at every corner of this bazaar. 7) SULTAN MURAT MOSQUE and CLOCK TOWER: Also known as Sultan’s Mosque, this is the biggest mosque in the Balkans and the main mosque of old part of Skopje. It was built in 1463 by Sultan Murat II on the foundations of an older monastery. The mosque stands next to a Clock Tower, dated from the 16th century. There is a wash area in front of the building and a tall minaret beside the mosque. 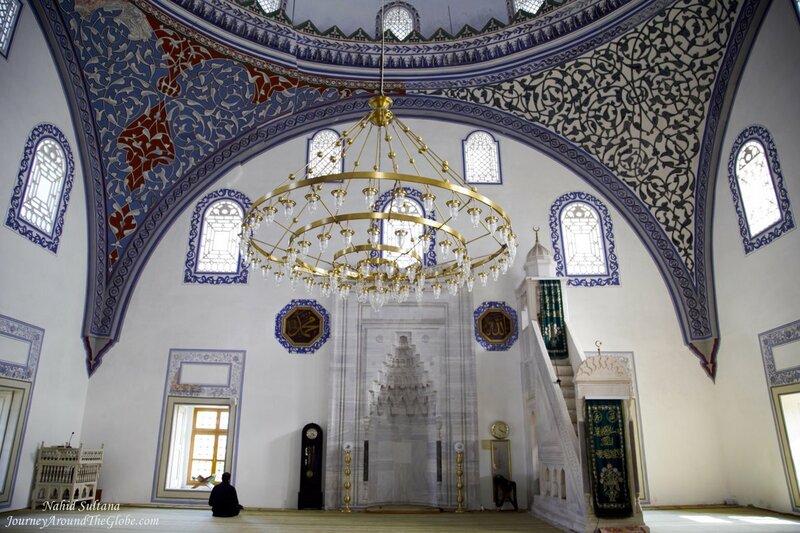 Sultan Murat Mosque is still active and holds daily prayers. Visitors are to respect the worshippers and need to take off shoes before entering the prayer area. Sultan Murat Mosque is a bit away from the center. We asked some young men about its location and they were kind enough to actually take us, which took about 10 minutes. Opposite of Sultan Murat Mosque is another 15th century mosque, called Isa Beg Mosque. You don’t have to pay anything to visit these mosques but donation is always appreciated. 8) CHURCH of the HOLY SAVIOUR: According to some historians, the original church dates from the 14th century. 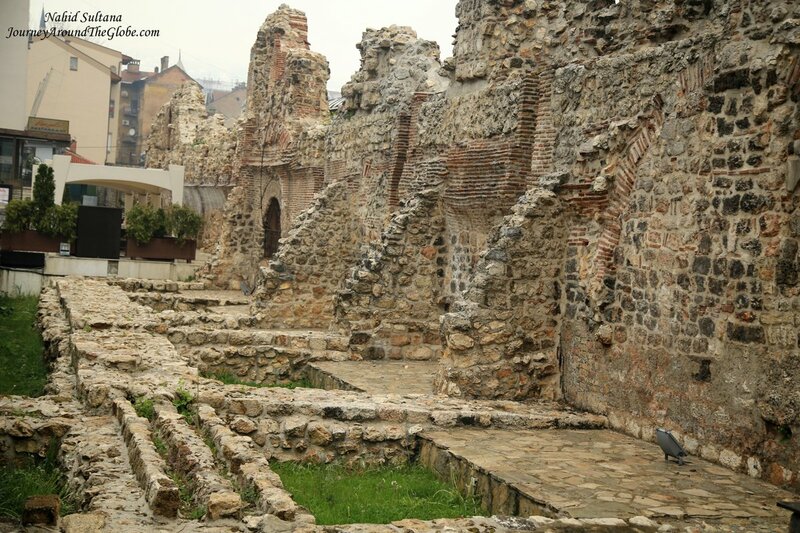 It is the oldest preserved church in Skopje. The church suffered a great deal from a fire in 1689. The church itself is tiny but has a pleasant courtyard. The sarcophagus of Macedonian’s greatest revolutionary hero Goce Delchev (who fought against the Turks) lies in the church courtyard. His remains were transferred to this church in 1946. There is also a museum dedicated to the life and revolutionary activity of Delchev. I loved this small but calm courtyard with trees and a small gardens. The church is interesting for its specific structure. Having been dug into ground to the depth of about 2 meters, it is a silent witness of the subordination of Christian edifices to Turkish dominant religious structures at the time. Inside the Church of the Holy Saviour, you can see an impressive iconostasis on the altar – a masterpiece of Macedonian woodcarving. This deep wood carving was done from whole wood boards and is not covered with golden paint. It is 10 meters wide and 6 meters high. It was handcrafted in the 19th century and took 6 years to finish this art. The earthquake of 1963, the south wall collapsed and unveiled a fresco dated from the 17th century. The church is located in the Old Bazaar, near Fortress Kale. It was 120 Denar per person to go inside the church but no fees to look around the courtyard or Sarcophagus of Goce Delchev. 9) MUSTAFA PASHA MOSQUE: This significant monument of the Islamic architecture is located on a plateau east of the main entrance to the fortress Kale. 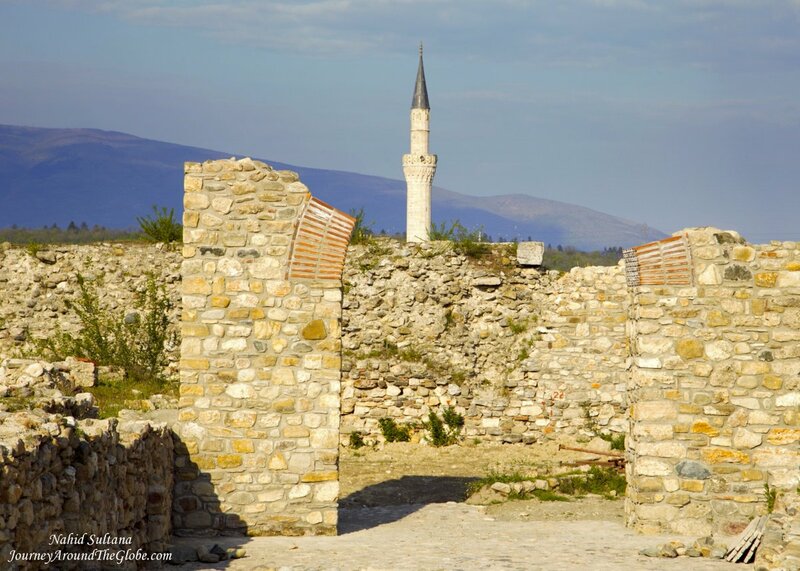 This historic mosque was built in 1492 by Mustafa Pasha, an Ottoman commander of Skopje. It was severely damaged by the earthquake in 1963. 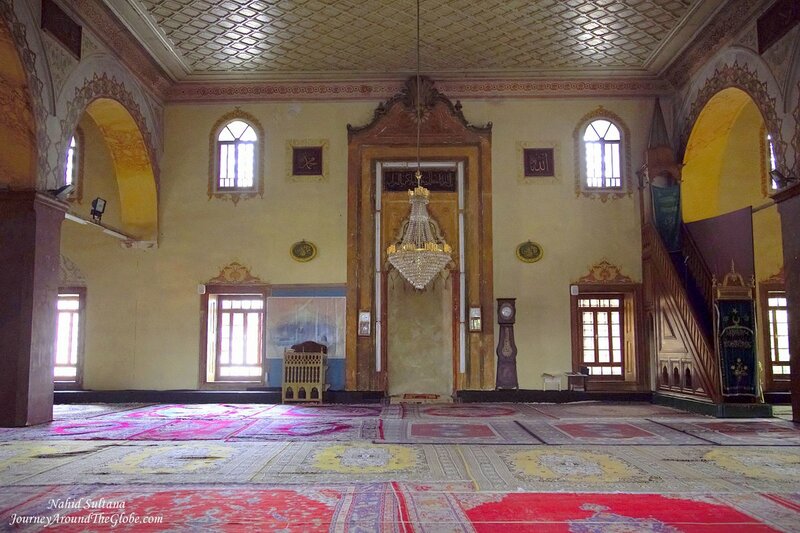 Currently TIKA, a Turkish organization, is conserving and taking care of Mustafa Pasha Mosque, a beautiful example of common historical and cultural heritage. 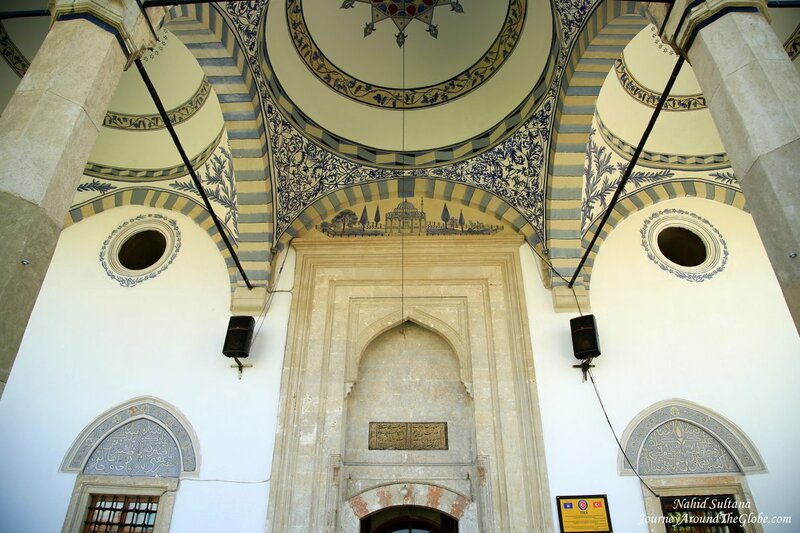 Mustafa Pasha is one of the most beautiful Islamic buildings in Macedonia with vibrant blue and white interior. Inside the mosque is very elegant, spacious, and well-preserved. The mosque has a square plan and it’s covered with a dome elevated on three-centered arches. Inside the mosque, there is a mihrab with plastic decorations carved in marble, and above the entrance door there is a gallery for muazzins (man who calls for prayer 5 times a day). The minaret of the mosque is built of freestone, and the extended part is built of marble decorated with ornaments. An ablution fountain, former structures, and several tombstones are part of this complex too. This old mosque is still in use, therefore visitors need to take shoes off before entering the main prayer area to respect the place and worshippers. There is no fee to enter but donations are appreciated. It’s located opposite of Kale Fortress. 10) SKOPJE FORTRESS: The Skopje fortress Kale, also known as Upper Town, dates from the 4th century BC and is the oldest known settlement from the Copper Age. It sits on the highest hill in the Skopje valley. The construction of the enormous ramparts on the Kale are mainly from the 6th century by the Byzantines. However, the fortress experienced its largest growth in the 10th century. In 1391, angered by the strong resistance of the people in Skopje, the Turks destroyed the city and parts of the city ramparts. But it was during the Turkish rule when the number of towers was up to 70, now only 3 remains. After that Kale continued to function as barracks. As a result of the disastrous earthquake in 1963, a large part of the Kale was completely destroyed. From the ancient impressive fortress today are preserved only one 121 m long rampart, three towers, and an enormous treasure of archeological finds. Among the find there are also remains of a number of churches, craftsman workshops and forges, and from the 12th century there are rare luxurious dinning dishes ornamented with painting, engraving and enameling. Some of the excavated dishes are true works of art, and the entire collection of such ceramics is one of the richest and most valuable in the Balkans. Kale Fortress is only in ruins now. But you get a fantastic view of Skopje from the castle hill and it is very attractive. We spent about little more than hour walking on its ground and on the old defense wall. There isn’t much to do other than enjoying the view and surroundings. A lot of spots were under restoration when we went, some new excavations were taking place on some spots too. There wasn’t any fee during our visit and it is right opposite of Mustafa Pasha Mosque. 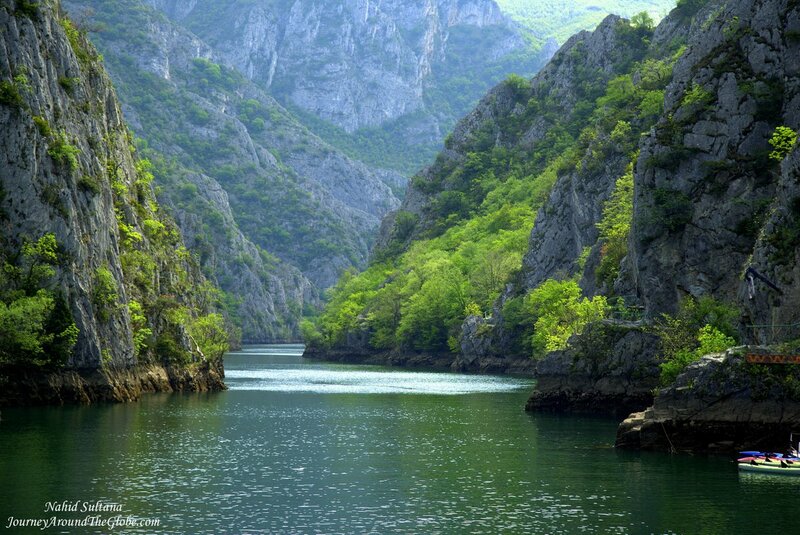 11) MATKA CANYON and LAKE: This was recommended by our hotel owner in Skopje. Next day, we checked out from the hotel and drove about half an hour to come to this beautiful gorge before heading towards Pristina, Kosovo. Matka Canyon is a fantastic place for the nature lovers, hikers, climbers, or even some expert scuba divers. 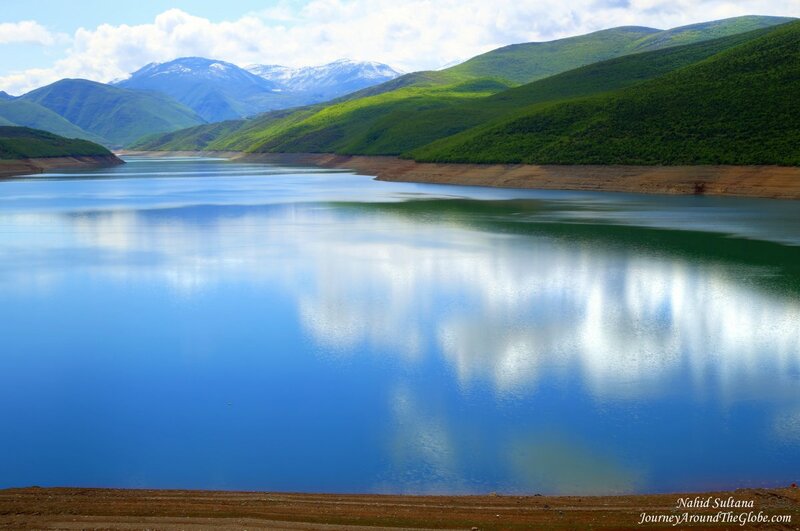 This place is surrounded by mountains, lake, caves, monasteries, and appealing views. 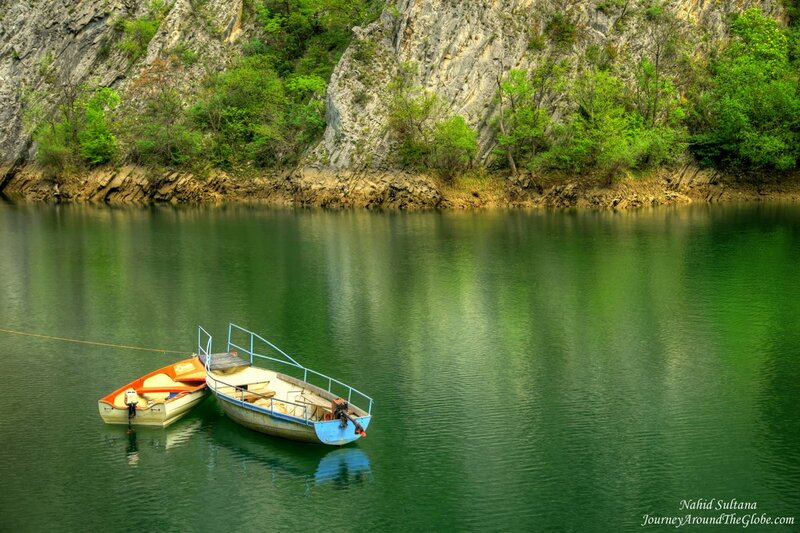 The long and snaky Matka Lake is about 35 meters deep. “Vrelo” (means “Spring”) where hikers can’t reach without crossing the river to the other side. You can hike more after the boat station if you don’t want the boat ride or not interested in cave. It’s 400 Denar per person to take a one hour ride on a small engine boat. It took us about 15 minutes to get to this cave which is about 6km from the boat dock. This 3000 years old cave was discovered only 35 years ago. We could hear the bats screeching and smell their poops. But the best part is that it is kept in its natural state. There were some light bulbs and some wet stairs to guide you thru. 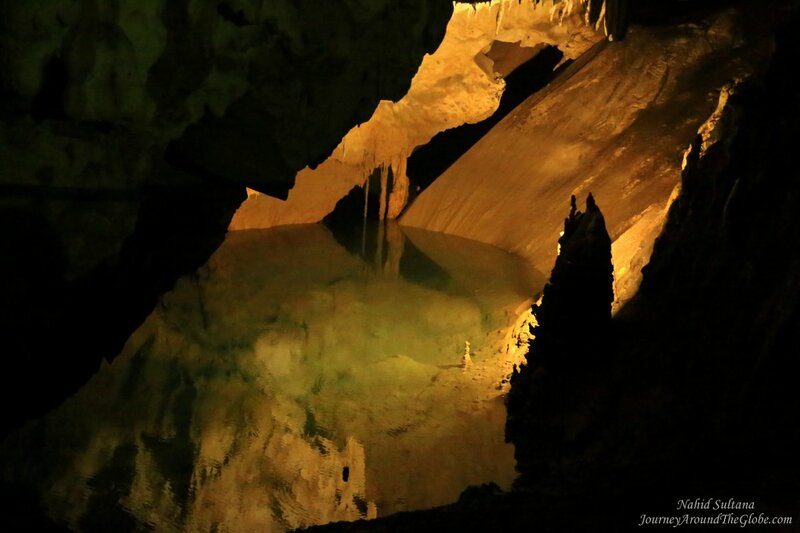 Surprisingly, there is a small lake inside the cave which you can see from few meters away. After the boat tour we sat down for lunch at Canyon Matka Hotel and Restaurant in a nice setting by the green lake and hills. This is the only eatery near the boat rental. There is an old monastery, St. Andrew’s Church, very close to the boat station and this restaurant. It was built in 1389. It’s a tiny place but has beautiful original frescoes on its old walls. It was free to enter. There was a kayak competition that day we visited this canyon. Therefore we couldn’t park closer to the lake. We had to park near an old monastery on a slope. There is no entrance fee to check out the canyon and lake. TIRANA, ALBANIA: Tirana is a flourishing metropolis and the capital of Albania. It is an interesting and charming city with hospitable and helpful locals. Tirana is considered a relatively new city, although antique monuments and artifacts can be found here and there. City’s buildings got new facelift recently with splashes of colors in a modernistic style to distinguish themselves from other grey ex-communist capitals. To my surprise, locals speak very good English and are willing to help any tourists with questions and concerns. If you are driving in to the city, just be careful of lots of traffic and crazy drivers. One problem you may face is that there are many beggars on the street near the city center. Little boys or girls may come running to you if you are in a car or on foot, especially if they know you are a tourist. They don’t mean any harm. What we did during this trip was that we used to box our left over food from the restaurants and give it to those hungry people who were in need. 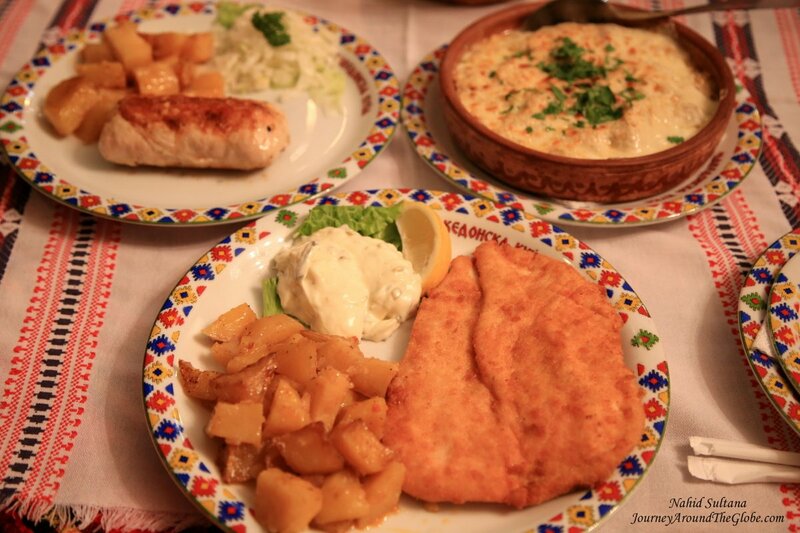 TIME of TRAVEL: We took a 2-weeks’ vacation to Eastern Europe during the Easter break of 2014. We first flew to Podgorica, Montenegro, stayed there for 2 nights, and drove about little more than 3 hours to reach Tirana. Again, we stayed here only 2 nights before heading out to Skopje, Macedonia. The weather was very mild, not hot, not cold…perfect for sightseeing. But Kruja can be a bit chilly because of its elevation, but we carried light sweaters everywhere and they really came in handy sometimes. 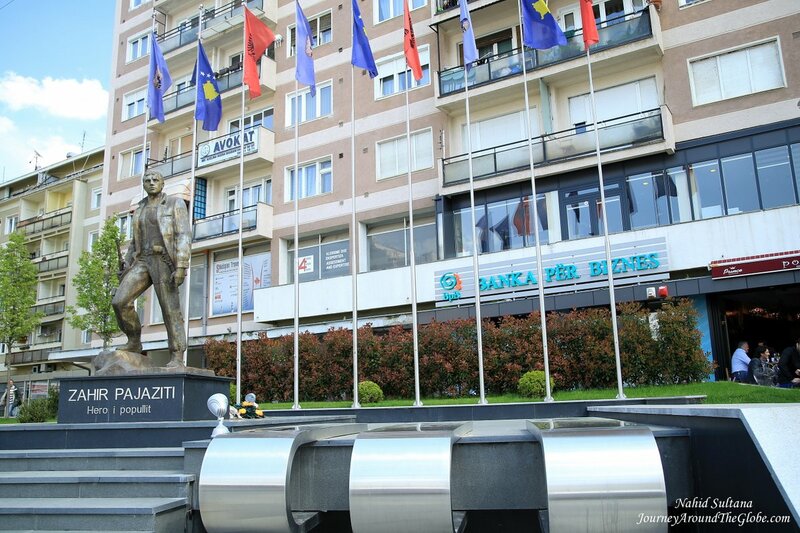 OUR HOTEL: We stayed in Hotel Tafaj, very close to the heart of Tirana, Skander Beg Square. It may not look all that from outside because of its congested location in front of a busy street. But once you are inside the hotel, it is a gorgeous and luxurious place for accommodation. Our room was a family suite and we had free breakfast, Wi-Fi, and parking with the price. 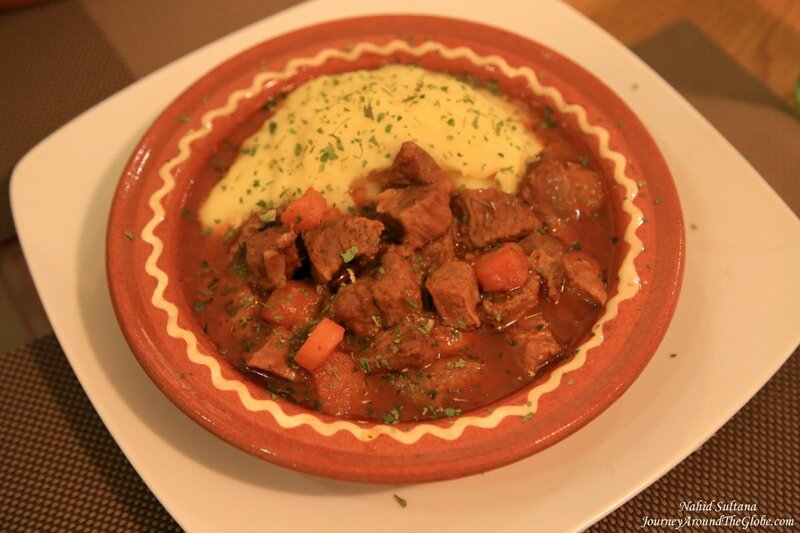 Their restaurant is also very good with traditional Albanian food and international cuisines. But there were plenty of other restaurants and sport-bars near the hotel. EATING and SHOPPING: Food is very cheap in Tirana and very tasty too. Albania has good quality road side restaurants and inns. After crossing the border from Montenegro, we saw at least one restaurant every few kms in Albania. We stopped at one of those service places where we had Greek salad (very popular in this region), tender kebabs, and hot bread for less than 15 euros for four of us. 1st dinner was at a local restaurant close to our hotel, called Kroce. It’s a traditional Albanian restaurant with extremely tasty food. 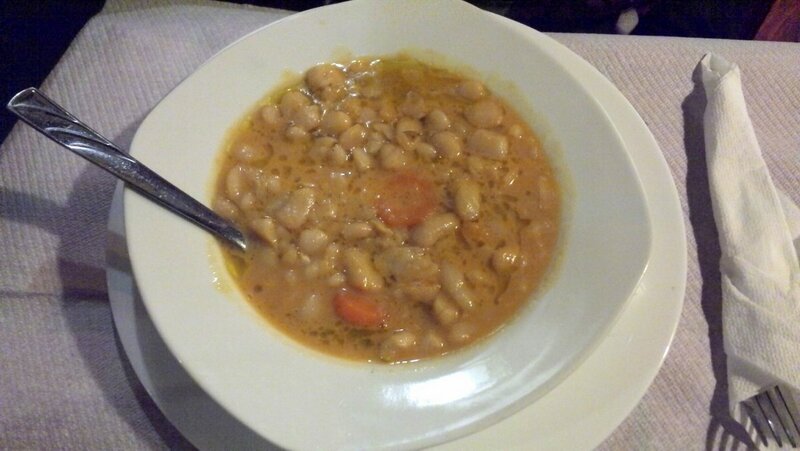 I had “Fasule” – a bean soup, my husband and kids had “Kernace” – spicy meatballs with “Simite” – fresh oven baked bread. The total bill was less than 10 euros for all of us…totally satisfied. 2nd day we were in Kruja. We had some doner kebab and Greek salad in a kebab place in the center of Kruja. There are many restaurants from all ranges here, but again, food is very reasonably priced here and you can get good portion of food for only few euros. The last dinner in Tirana, was at our hotel restaurant. They also had local dishes with some international plates. We didn’t really see any souvenir shops in Tirana. 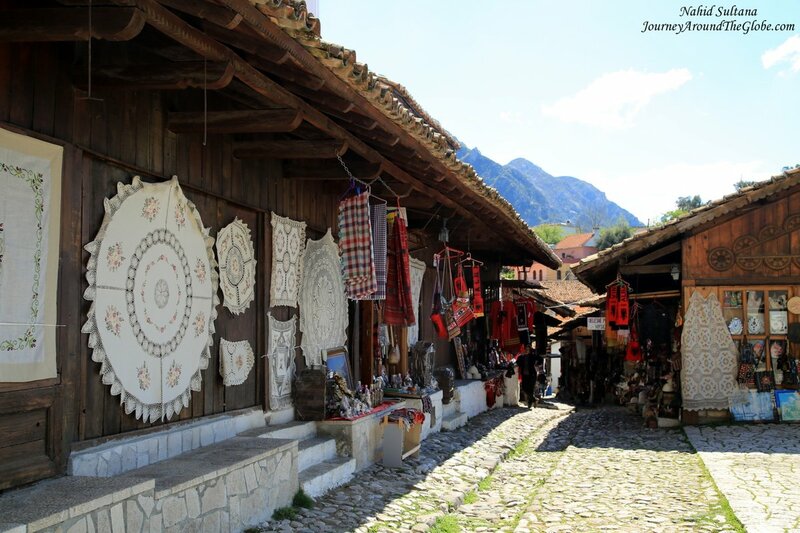 We did most of our souvenir shopping in a village, called Kruja where you can get authentic Albanian hand-crafted items. Handmade items, Albanian dolls, carpets, teapots, jewelries, and lots of other things are some good choices to take back from Albania. There were one or two souvenir shops that I saw in Tirana when we were driving by, but nothing really in the center. PLACES WE’VE VISITED: Originally, we were thinking about spending a day and half in Tirana. But after visiting Skander Beg Square on the 1st day, our hotel lady suggested that we go out in the small villages or coastal cities or to the mountains to see the real beauty of Albania. We took her words and spent the next day visiting Kruja and Petrela. But if you are spending more days in Tirana, you can visit lots of other nearby historic cities and villages. Albania is a beautiful country and you won’t regret exploring its every corner. It has something for everyone’s taste. 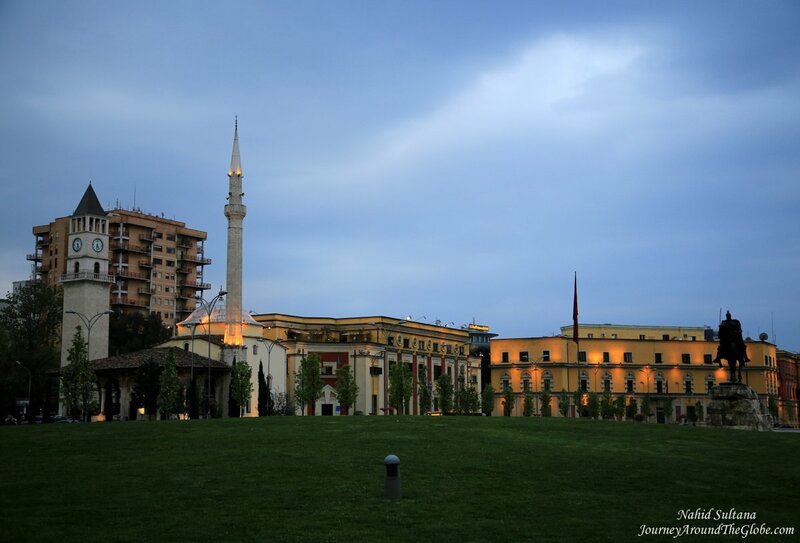 1) SKANDER BEG SQUARE: This big plaza is the main square of Tirana. It’s a lively and crowded place with some important and historic buildings surrounding the square, like Opera building, National History Museum, and some government buildings. National History Museum is the main museum in Tirana. The building is easily spotted because of a huge mosaic on its front façade. We didn’t go inside the museum or the opera building, just took a stroll in the square on the first evening. 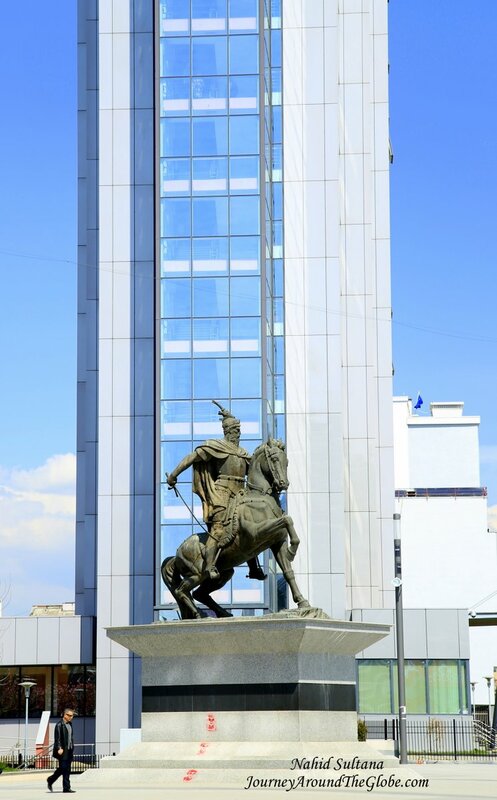 A statue of Albanian hero Skander Beg in horseback stands in the middle of the square on a grassy field. 2) EH-TEM BAY MOSQUE: This is a small but very beautiful mosque with a tall minaret in Skander Beg Square. 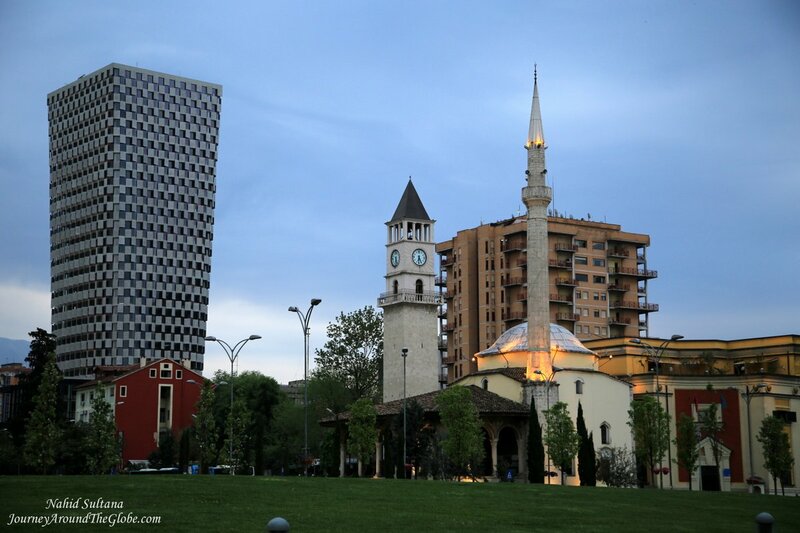 It’s located right beside Tirana Clock Tower, which is the symbol of this city. 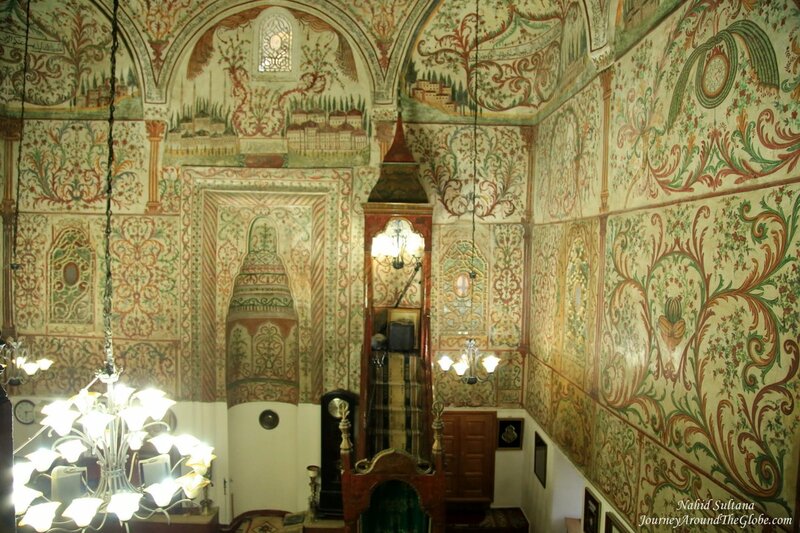 The mosque was built in 1793 and is considered as one of the most beautiful mosques in Albania. The care taker of the mosque took me inside and told me to go to 2nd floor to get a nice glimpse of the whole interior of the mosque. It’s not that big but has an artistic dome as well as interestingly decorated walls. Tomb of Eh-Tem Bay is at the entrance of this mosque. It’s free to go inside. 3) KRUJA CASTLE: On our second day in Tirana, we drove to another historic town of Albania, called Kruja. 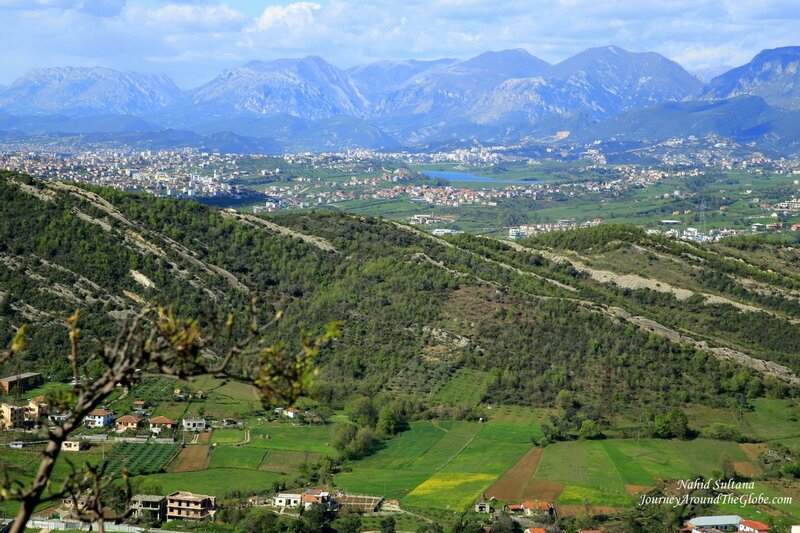 It’s a small town about 35 km northwest of Tirana and rises 560 meters above sea level. It makes a perfect half a day trip from the capital if you enjoy nature and fresh air. 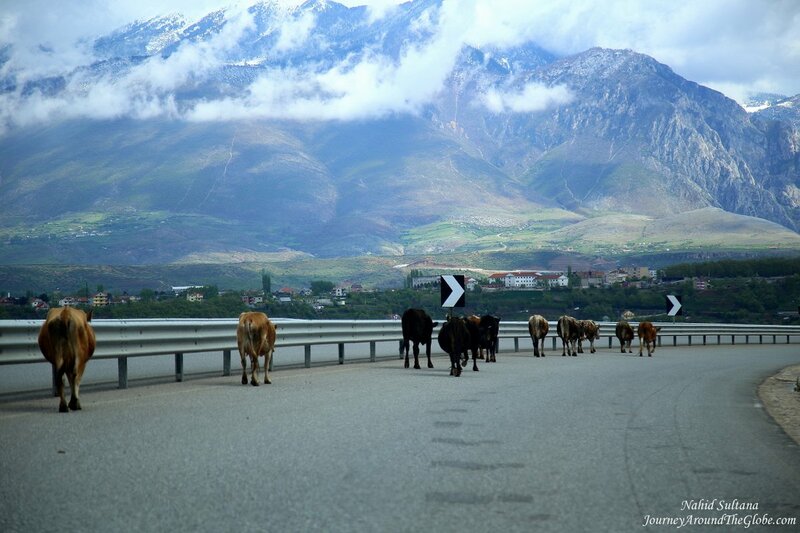 The drive from Tirana to Kruja was very pleasant and scenic. 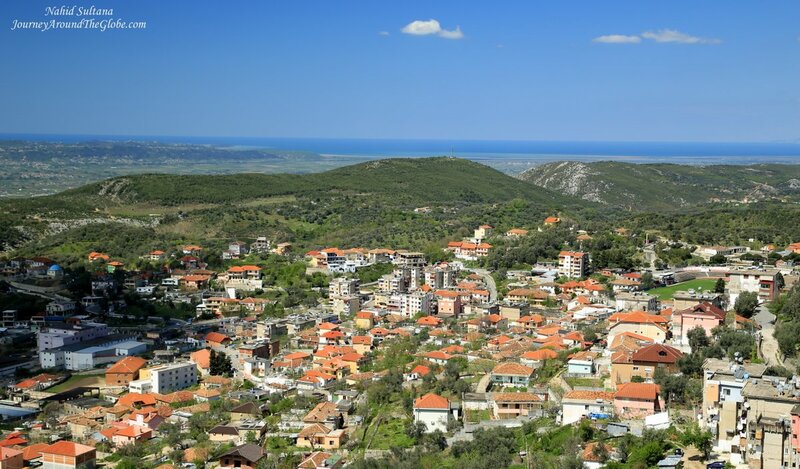 The town of Kruja sits on a hill and is known for its hand-crafted items, such as things made with olive trees, traditional Albanian dolls, hand-painted copper items, carpets, and etc. Most of these are hand made by the villagers of Kruja. You can bargain on the price and may get a good deal if you buy more than one item from the same seller. Before reaching the castle, we passed by the old market of Kruja where you can buy all those above local trinkets. It’s a long stretch of shops on cobbled street. There were plenty of restaurants and cafés too. The market was so colorful and lively that even if you don’t buy anything taking a walk thru it is a must. I found the people very friendly and helpful here. They will come and start conversations if you look like a tourist. After passing the market and Skander Beg Museum, we saw the tower of Kruja Castle on a small slope. The castle is in just ruins now. But it provides a great view of majestic landscape to the visitors. 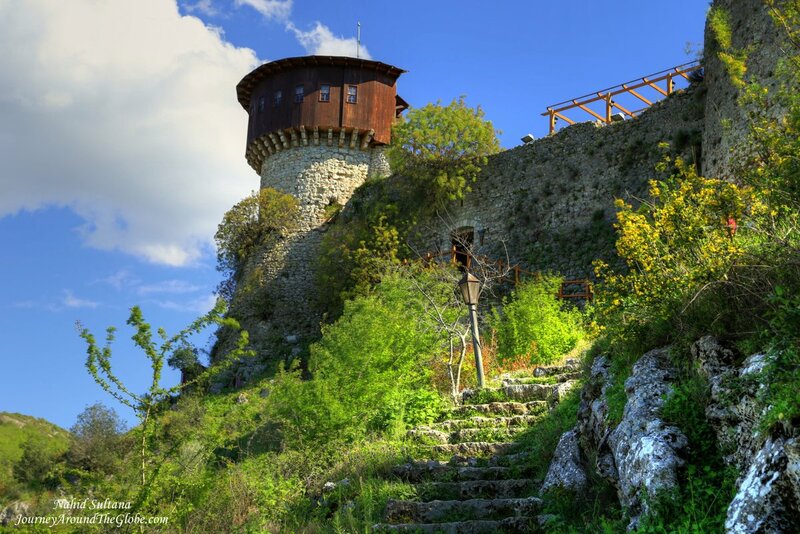 The castle was built during the 5th and 6th centuries and has an elliptical shape with a total area of 225 hectors. 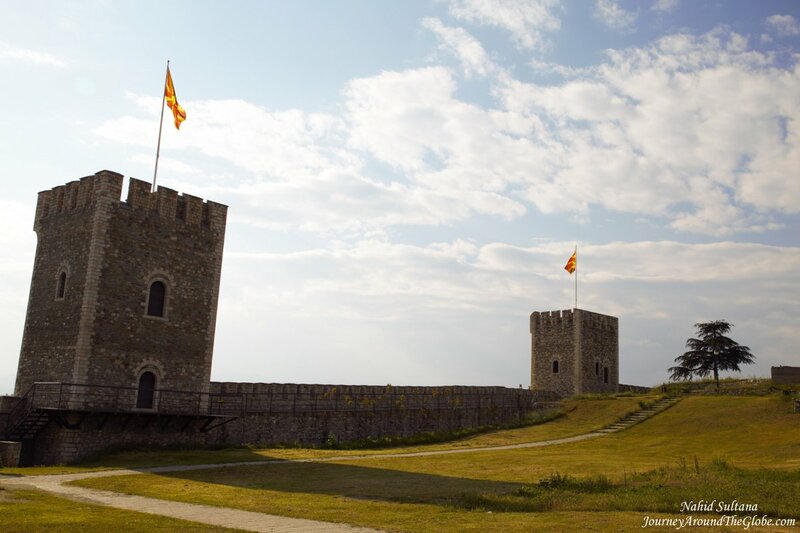 The surrounding walls are reinforced by nine towers, which served as an observation and signaling post during the times of war. Within the walls of the castle some remains of few houses can still be found. Although we didn’t visit Skanderbeg Museum, it is a well-known museum in Albania. Kruja has a rich collection of historical and cultural objects. For me, the old bazar and view from the mountain were the highlights of Kruja. There is no fee to see the castle. You can enjoy the view and some hot drinks or meal in the café on the hill. 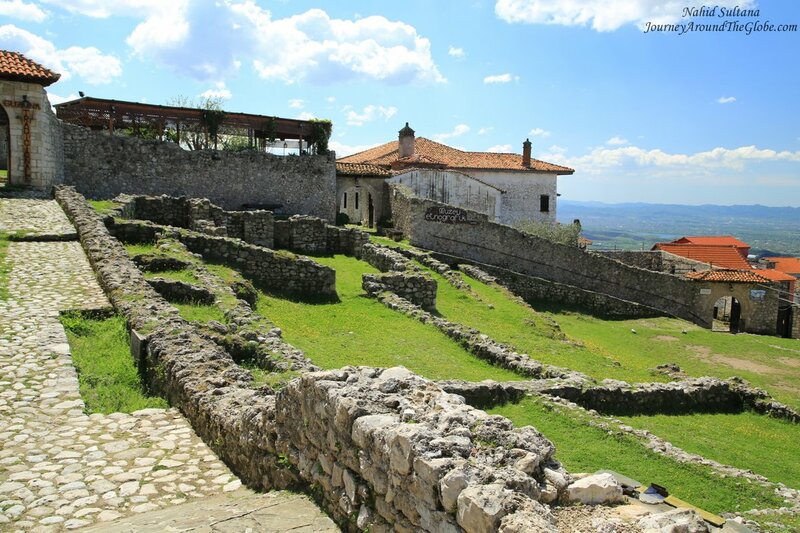 4) PETRELA CASTLE: This is one of Albania’s best-preserved castles, sitting picturesquely on a steep slope overlooking a river and the nearby small towns. On a clear day, you can see all the way to Kruja. The tower in the center dates back to 500 AD, surrounding it are walls from the Byzantine period, laid out in a triangle, with round towers at the corners. This castle was used during Skander Beg’s war against the Turks. There are many uneven stairs to climb to up to the castle. Only the skeleton of the castle stands now, but the gorgeous view of the valley and mountains are worth all the hard work. It is not stroller friendly and there is no place to keep the stroller for a while. There is a cozy little restaurant all the way up in the castle. It was empty but open and serves local delicacies. It’s free to enter the castle complex as well as the parking was free. 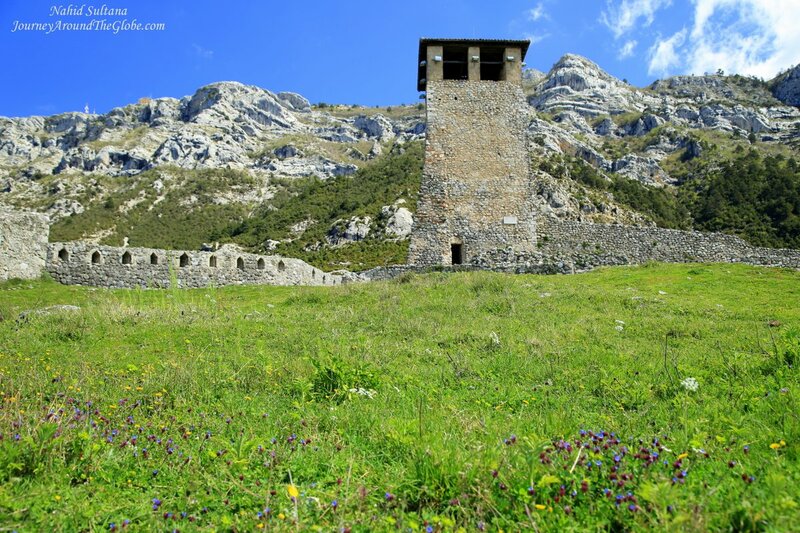 Petrela Castle is about 15km southeast of Tirana, takes about half an hour from the center of Tirana. I saw only one souvenir shop at the bottom of Petrela and some snack places.